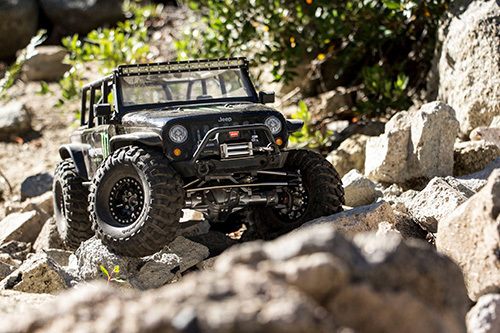 Mission Viejo, CA (December 22, 2015) – Since the release of the SCX10 Jeep Wrangler Unlimited C/R Edition vehicle, Axial and Casey Currie have made an unstoppable team. 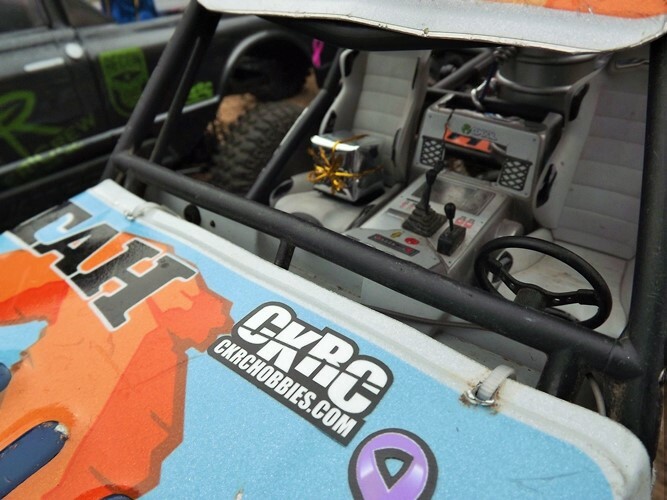 In 2015 Axial and Casey Currie made their presence felt at events around the nation. Moving into 2016, Casey and Axial reflect on all that was accomplished, and the growth that next year will bring. 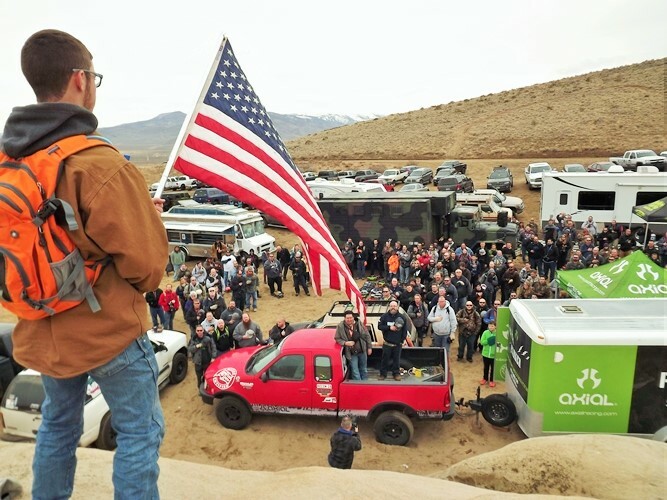 It started at the King of the Hammers where Axial had a test track set up for fans to enjoy and where Casey ran multiple classes of race vehicles. 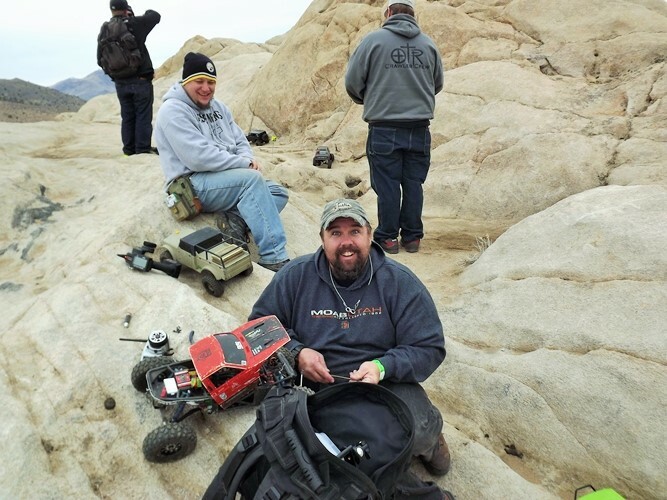 Between races, Casey would bring his personal Axial vehicle to the test track to run with other fans and enthusiasts. 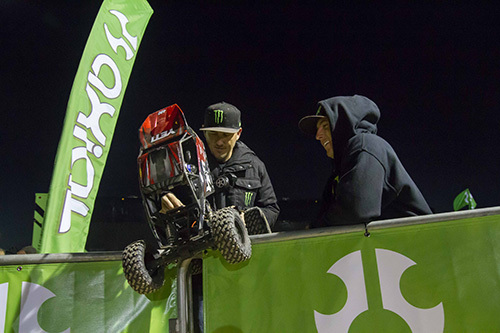 Throughout the Hammers week, Casey and Axial were a hot bed of activity, drawing huge numbers and smiles. 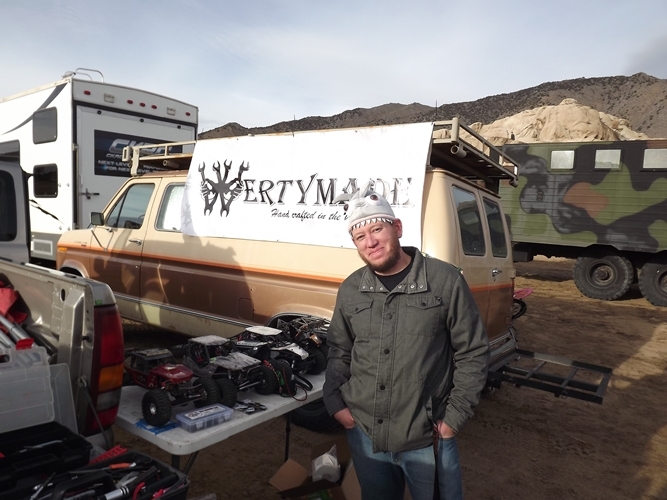 Then it was on to the 2015 Lucas Oil Off Road Racing season where Casey and his Axial vehicle made 9 different stops around the southwest and Mexico. 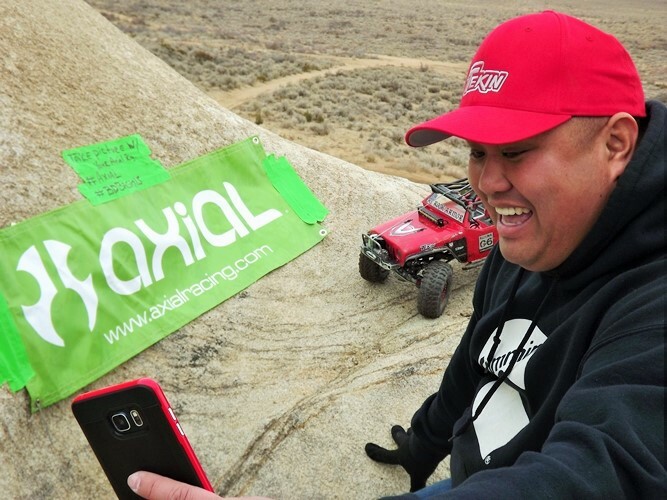 From California, to Baja Mexico, Arizona, Utah, and Nevada, Axial Brand Ambassador, Casey Currie, brought the joy of running his Axial Jeep to the short-course off-road audience. 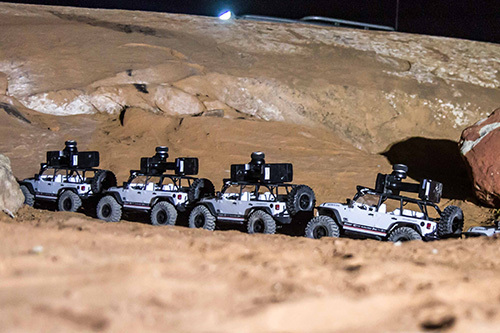 They made more appearances at Easter Jeep Safari in Moab, Utah where Axial set up a full-course track where big names from the off-road industry all gathered to race their Axial Jeeps. 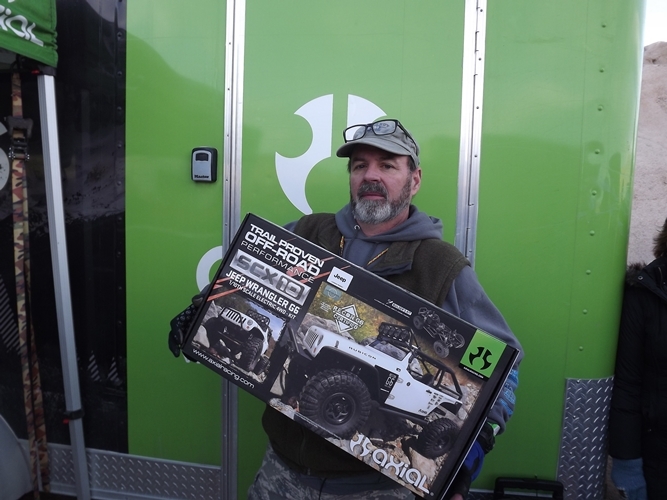 In case there was someone who did not have an Axial Jeep there, Axial provided a fleet of the CRC edition Jeeps so everyone could participate. 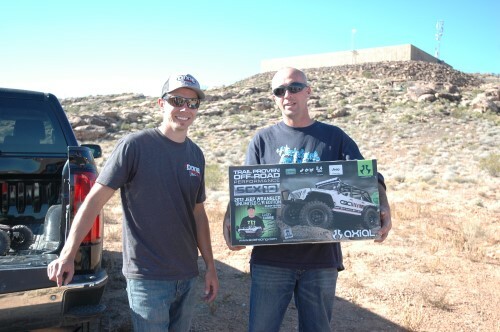 Casey found his way through the group and brought his CRC Edition SCX10 Jeep into the victory circle first. 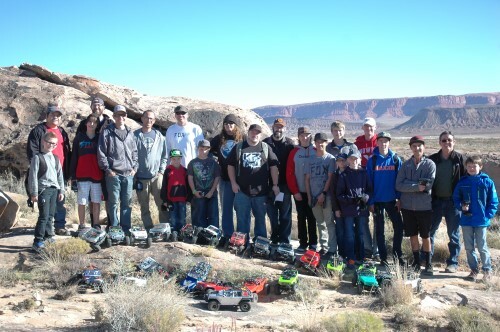 Everyone had an amazing time and Casey looks forward to defending his Axial Moab Night Crawl title. It was then off to Butler, Pennsylvania for the Bantam Historic Jeep Festival that was celebrating the 75th birthday of the Jeep. 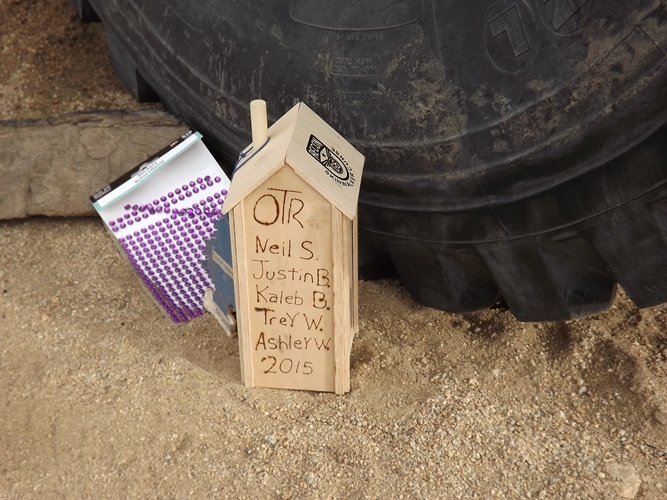 Unfortunately, the event was cut short due to rainstorms, but Casey still made an appearance at the Axial obstacle course to see fans and make a few quick runs on the course. 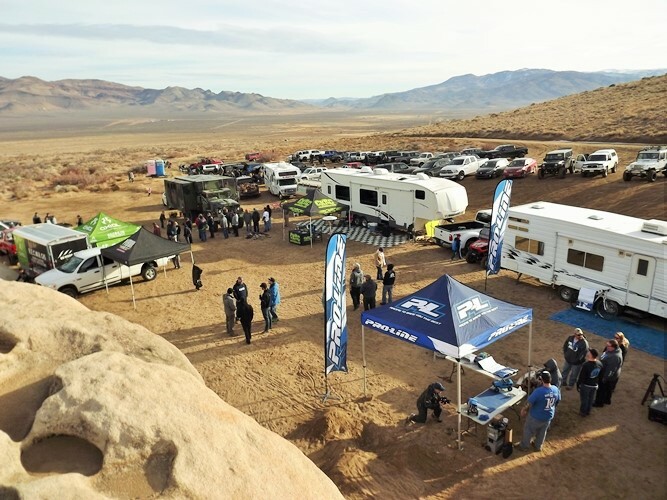 From the bad weather of Pennsylvania, to the beautiful skies of Northern California, another big stop for the Axial-Currie team was the Jeepers Jamboree in Rubicon. 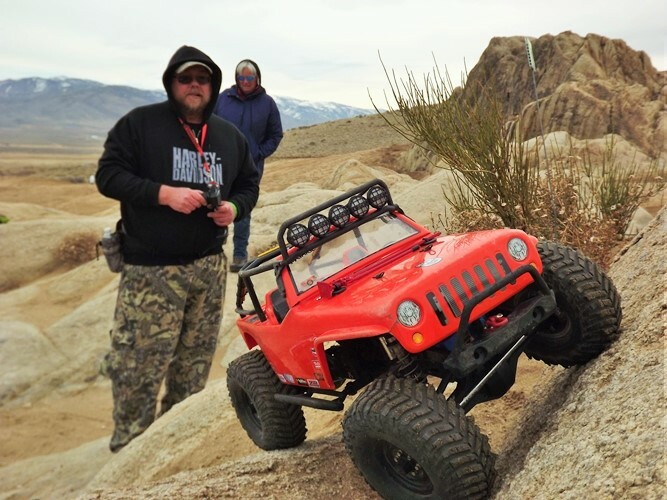 Along with Casey, Randall Speir, from Dana Spicer and Matt Chapman from Monster Energy, they all conquered the treacherous trail and made time to run their Axial Jeeps in some of the most picturesque landscapes in California. 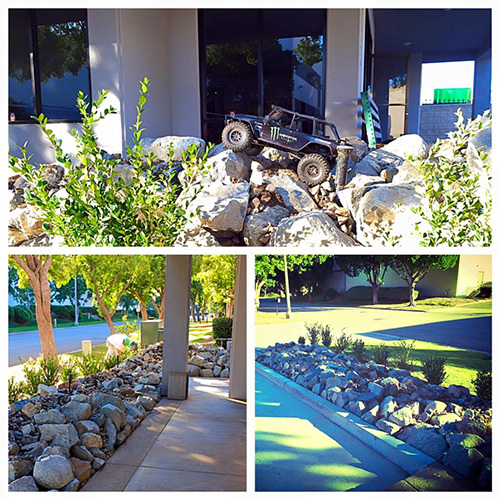 Inspired by his adventures with Axial, Casey even built an RC rock crawling track at his shop in Corona, California. 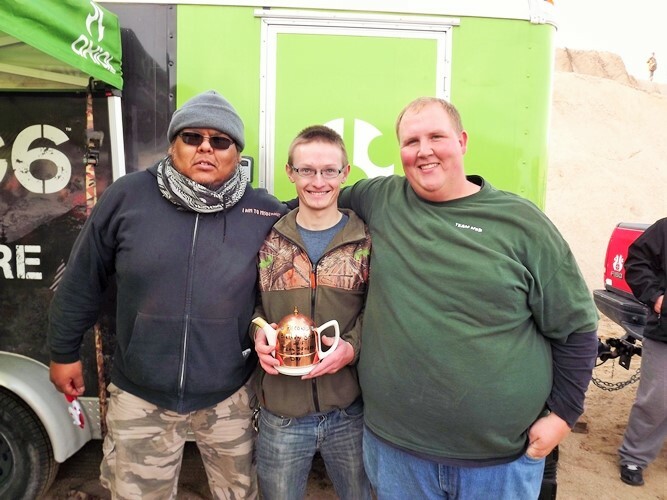 It was just completed and Casey had a big reveal and open house to show off the new improvements to his shop on December 17, 2015. 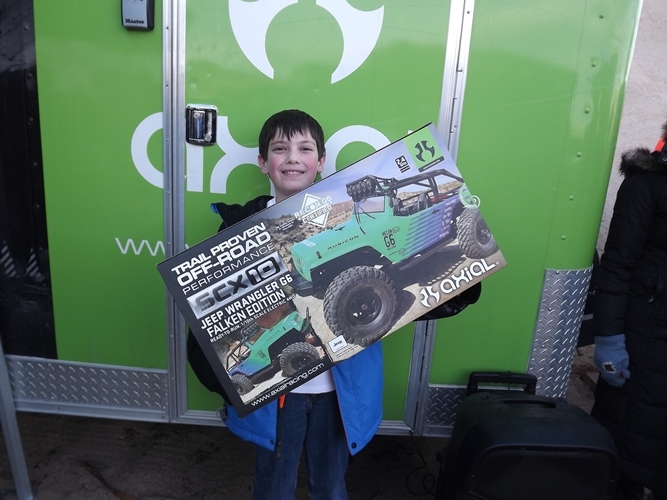 Together, Axial and Casey have had quite a year! 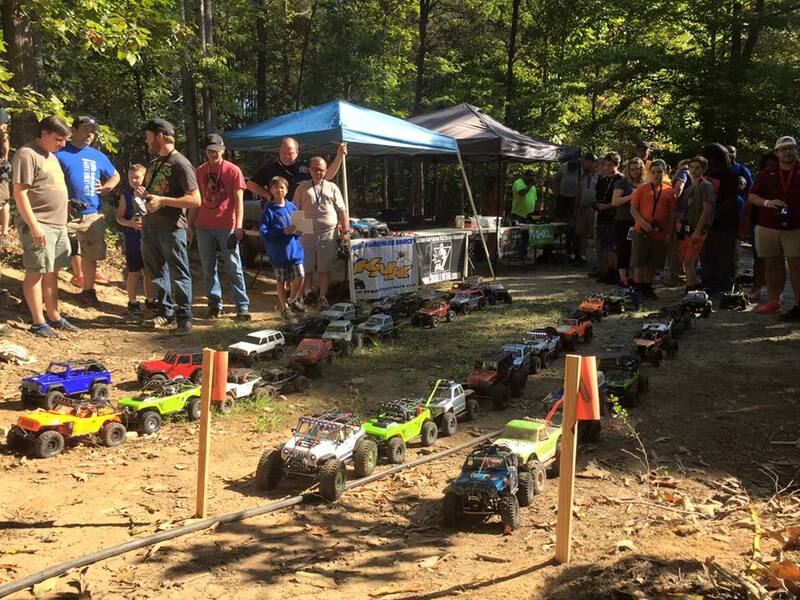 They are spreading the popularity of Axial Jeeps and all the great family fun that can be had. With more events planned in 2016, there is a lot to look forward to! 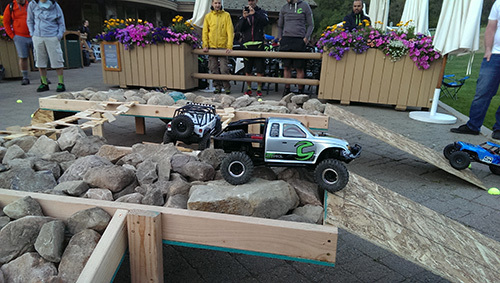 For the annual Cannondale Sales meeting, the group wanted to do something fun during dinner after spending the day shredding the upcoming new mountain bike models in the mountains of Northern Utah. 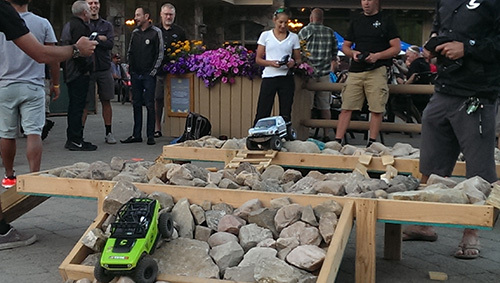 The Cannondale crew created a modular crawler course that required drivers to ease their way over and across multiple features aiming for the lowest score possible. 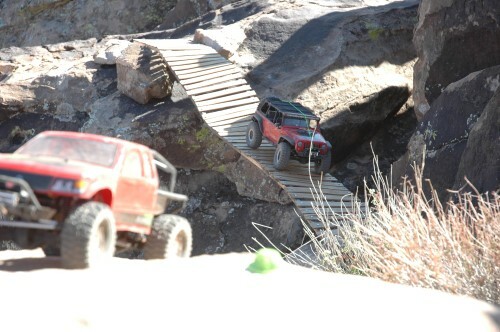 The course had steep rock piles, sketchy wood bridges and a twisty “humpback” wood feature. The course required perfect steering, a little bit of luck and serious throttle control. 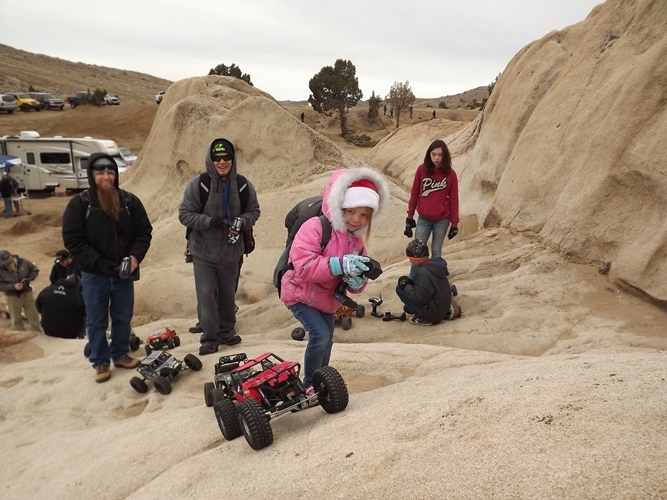 For the majority of the group this was the first time they had tried scale crawling and the crowd loved every minute of success and failures. 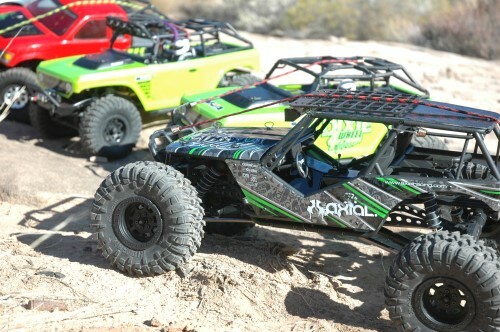 Cannondale used a combination of Axial Wraith’s and Axial SCX10′s on the course, each with a unique advantage. 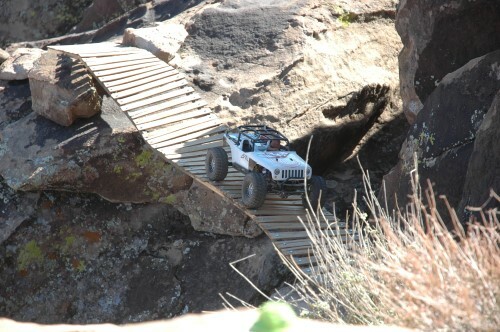 The Wraiths cleared the rock sections easier but the SCX10s were the car of choice to navigate the narrow swinging bridges. 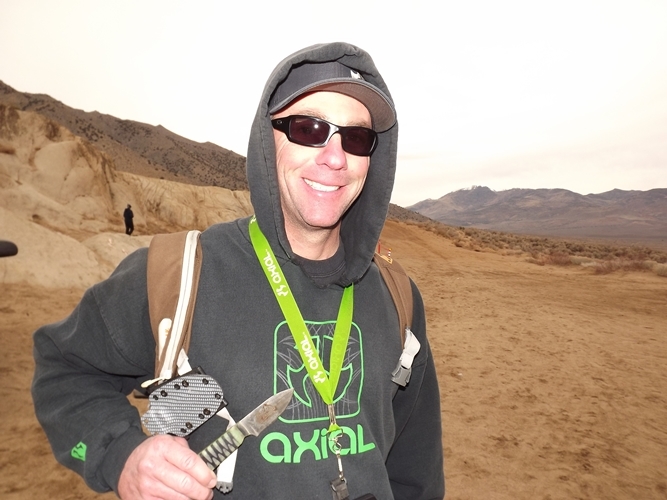 Chris Jones, Global Marketing Manager for Cannondale MTB, stated that adding the Axial rigs into their event made a great company event even better and hopefully the first of many more. 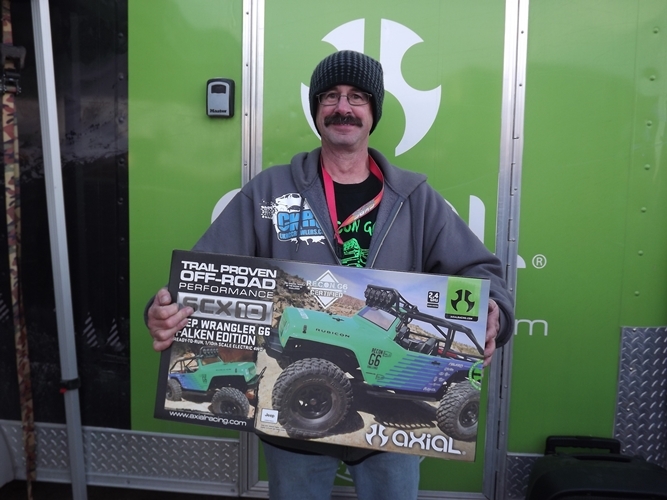 From all of us at Axial R/C Inc., we thank you Cannondale for choosing Axial and sharing your enthusiasum – sharing our enthusiasm! 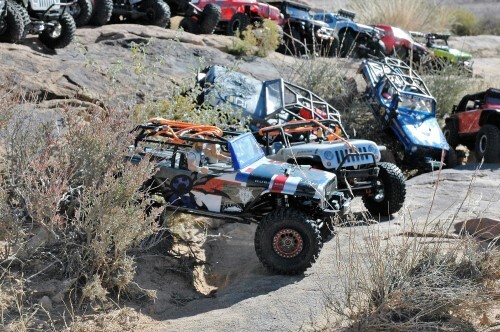 Rock racing combines rock crawling with off-road racing, and yet, it’s so incredibly different than either. 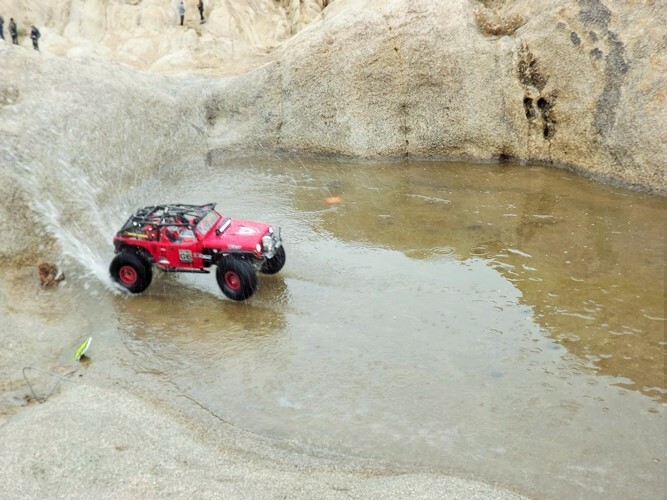 It’s more brash and intense than technical rock crawling and it’s more about sudden bursts of speed than wide-open off-road racing. 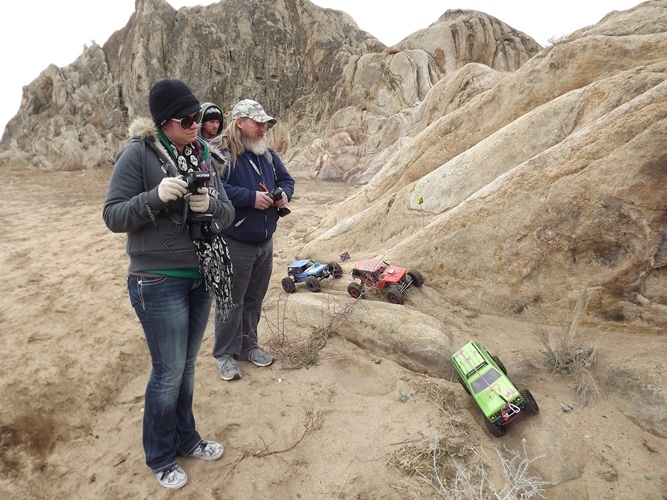 As such, setting up a vehicle for competitive rock racing can be a little tricky. 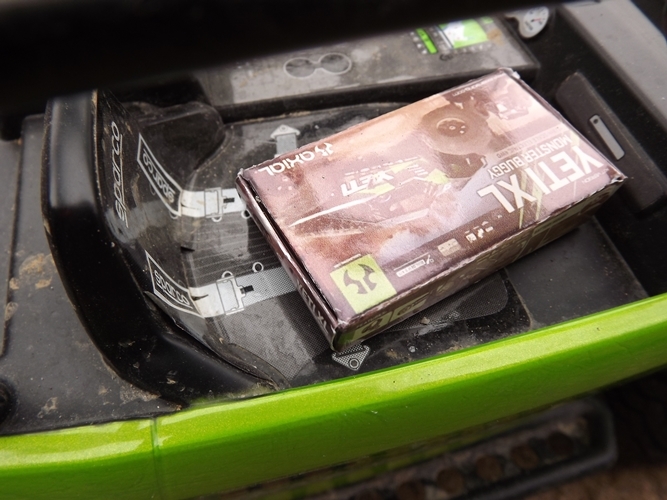 Whether you’re brand new or already experienced, used this guide to make sure your Axial Racing rig is properly prepared for the ultra-demanding world of rock racing. 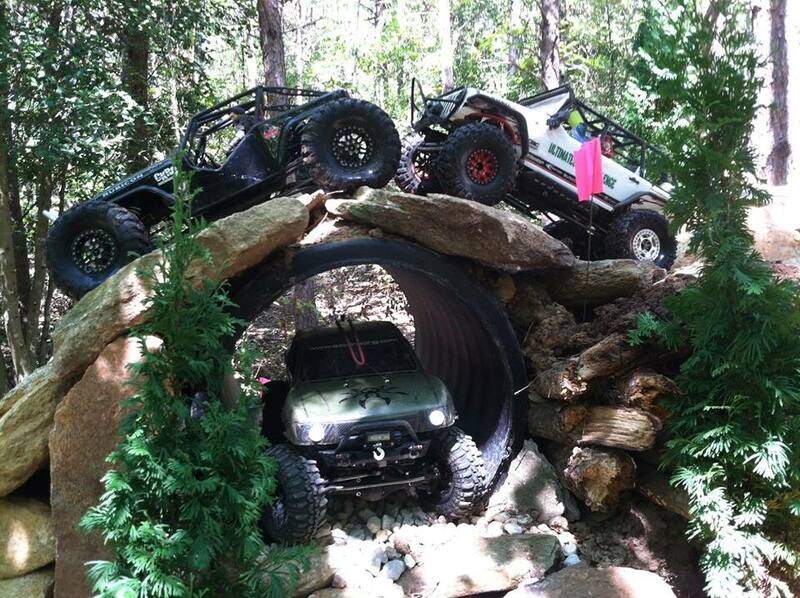 Rock racing calls for true dual purpose tires. 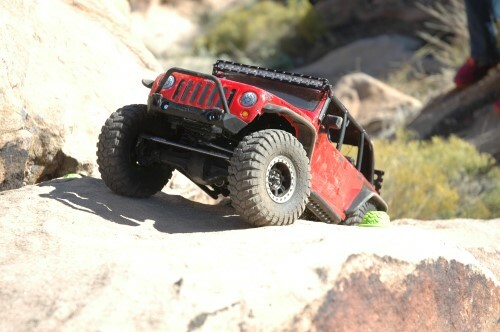 The tires must deliver high speed performance on dirt and also provide rock grabbing traction—two very different tasks. 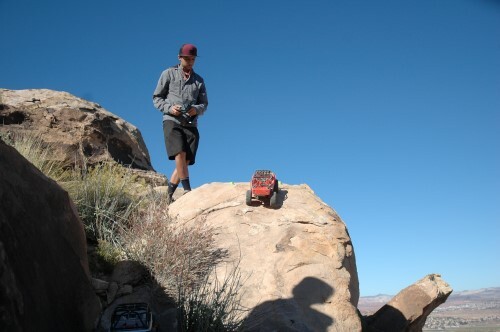 And, the amount of each type of terrain—dirt versus rocks—isn’t likely to be equal. 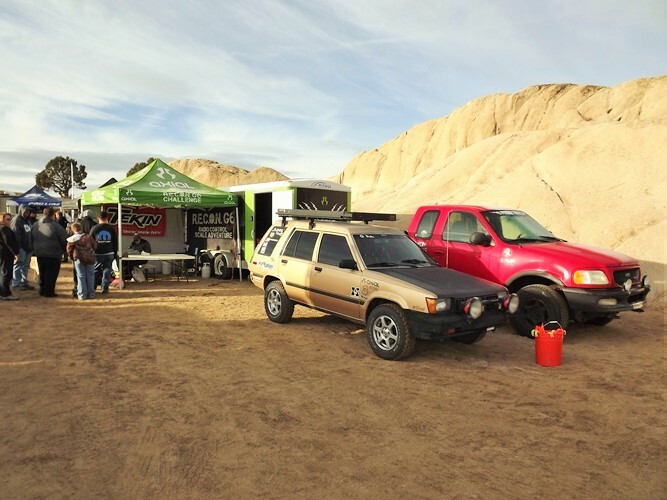 Depending on where you are rock racing, it may make more sense to concentrate on the high speed portions and go with tires that work best on dirt, or vise versa. No matter what, you will most likely be making some sort of compromise. Typically the compromise comes in the form of the foam inserts. Soft foam inserts will help tires conform to rocks, while firmer foam inserts will improve high speed performance. The track you’re racing on will determine which way to go. 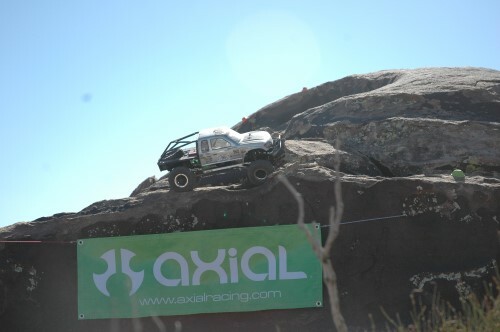 When selecting tires for competition, go with a soft compound such as Axial Racing’s R35 (white dot). These will provide the best traction on dirt and rocks. It’s also worth noting that if your vehicle is hard to control on the fast section and wants to spin out, you can try a harder compound tire up front and/or a less aggressive tread pattern on the front tires. Another secret to know is a larger pinion gear can also cure spinning out as it eases acceleration and the ability for the tires to break traction. 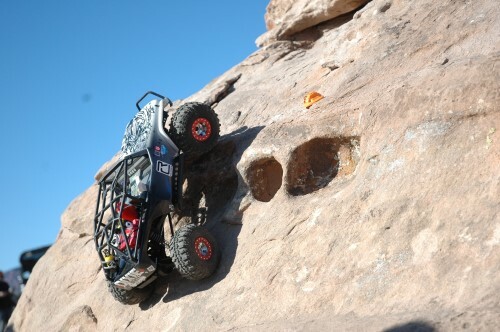 In rock crawling there is no such thing as too low of a center of gravity. This still hold true for rock racing. A low center of gravity will improve your vehicles ability to climb without tipping over backwards and a low center of gravity will keep your vehicle stable in high-speed corners. Depending on the class you’re running how you can lower the center of gravity easily varies. 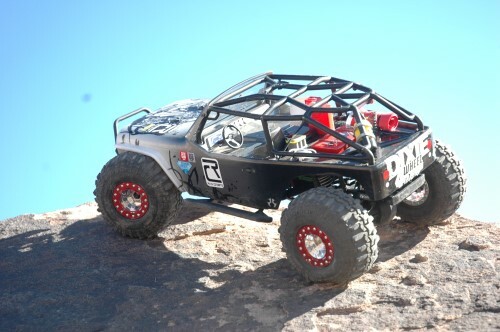 If you’re running a full Lexan body, lower it as much as possible and open up the wheel wells to allow room for the tires to move as the suspension cycles. Bodies weigh more than most people realize and you can see a huge performance improvement by simply lowering. Unless rules require it, lose unneeded accessories such as spare tires. While light buckets only weigh a few grams, for the best possible performance, you may consider removing or moving light buckets. 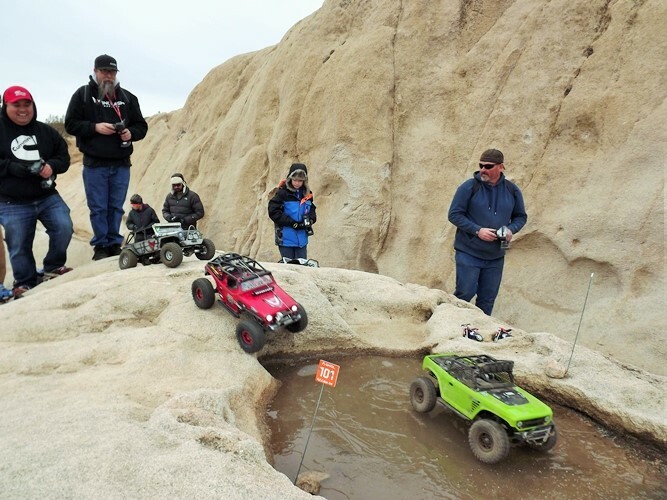 Since rock racing involves jumps, weight distribution (also known as weight bias) is very important and a little more complicated compared to a pure rock crawling setup. 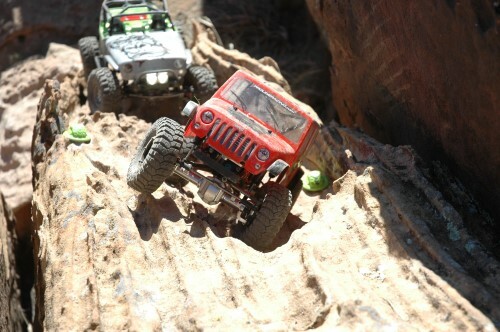 More weight up front is best for rock crawling, it isn’t that simple for rock racing. 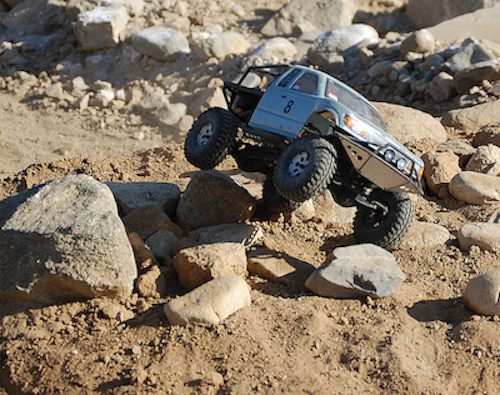 A neutral or slightly weight forward weight distribution is preferred as it will not overly compromise rock crawling performance, but too much weight forward of center can cause (or exasperate) nose diving off jumps. You simply have to test on the track your racing or on jumps of similar size at the speeds you’ll be hitting the jumps. While not a weight distribution issue, the first thing to check when experiencing chronic nose diving is your ESC’s drag brake setting. 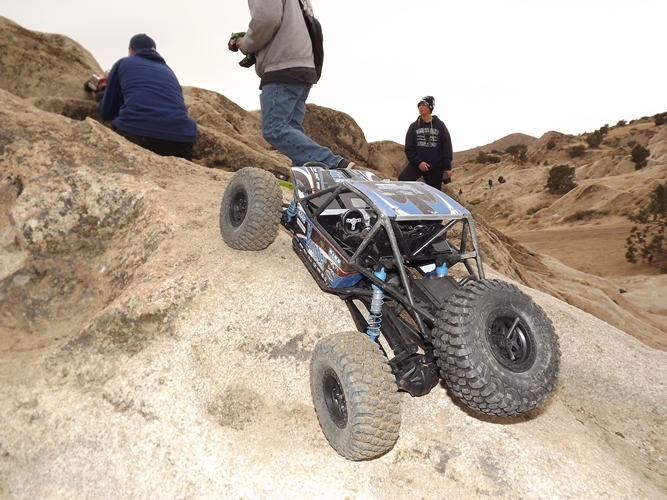 While drag brake is essential for rock crawling, it can cause nose diving by automatically applying brakes when you let the throttle go to neutral in the air. 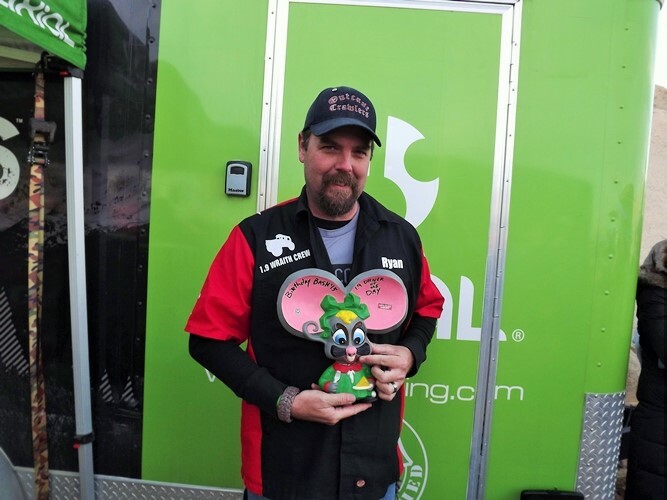 Less drag brake is more when it comes to rock racing. 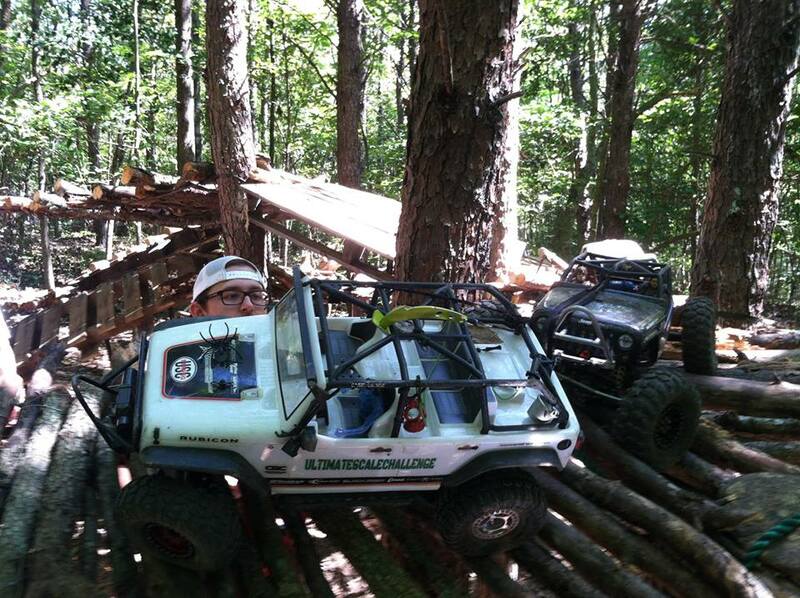 Just be sure to maintain control on the downhill sections many tracks have. Most people think racing is all about speed—all about being the fastest. 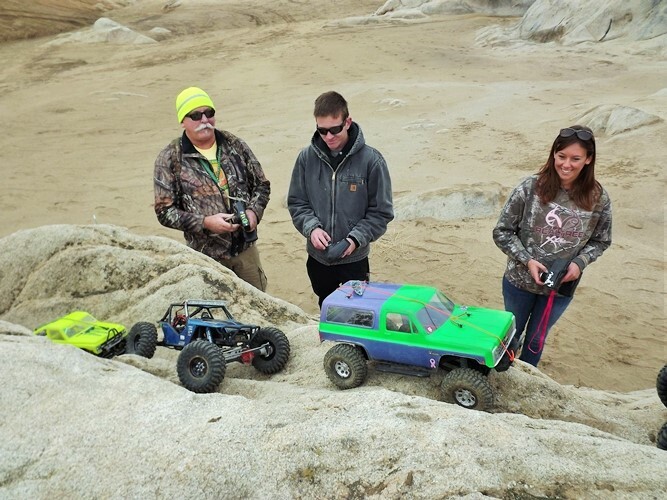 In rock racing, durability is far more important than speed. 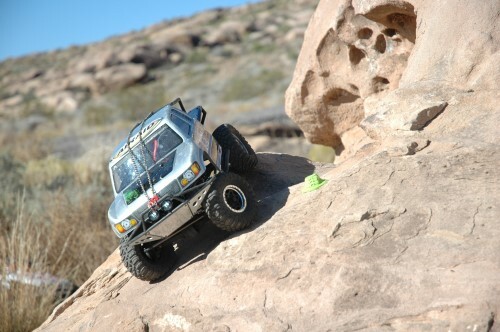 In real racing and in RC, no racing competition is as hard on a vehicle as rock racing. 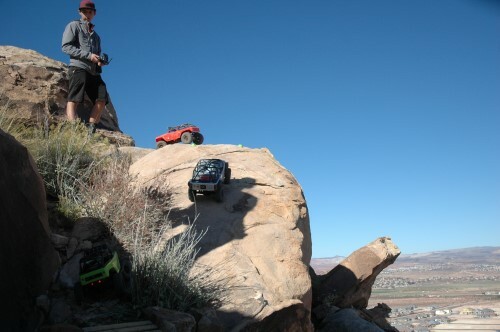 Rock racing is an incredible challenge—one that’s very hard on the vehicle. 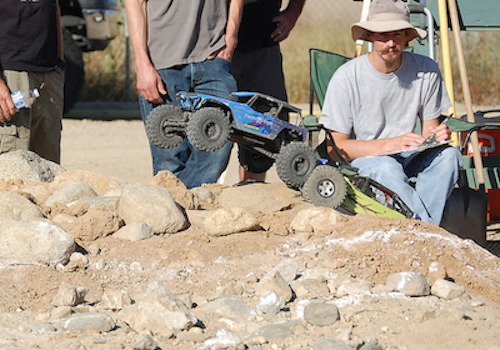 In full-size rock racing, at events such as the King of the Hammers, most entries don’t finish. 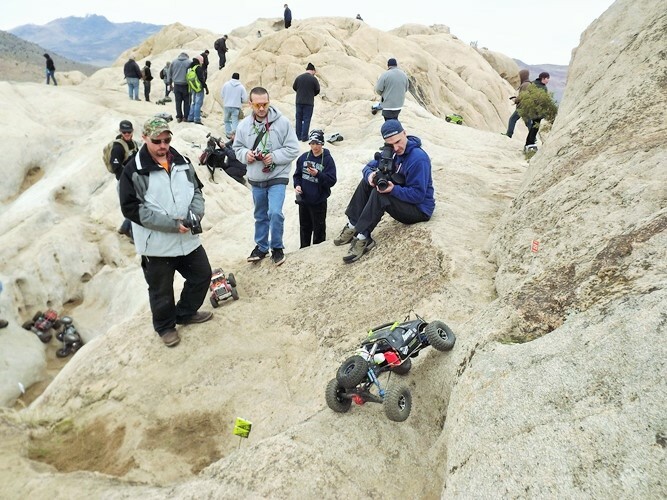 RC racing is often the same if vehicles are properly prepared for the rigors of racing. 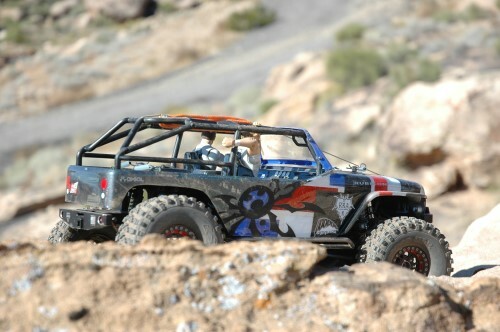 Aluminum parts are they way to go for rock racing. They increase durability without adding too much weight. Titanium, if your budget allows, is an even better choice. Be warned, titanium doesn’t bend and rebound like aluminum. It’s stronger, but it snaps instead of bends when stressed to its limits. 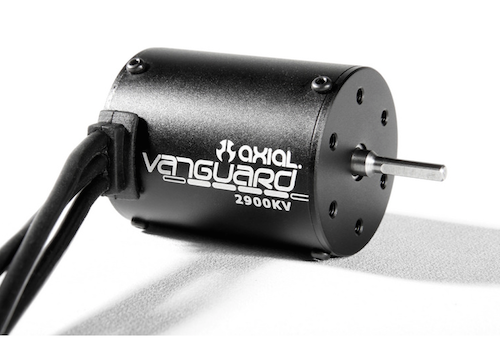 Start with an aluminum servo horn. This is an absolute must. 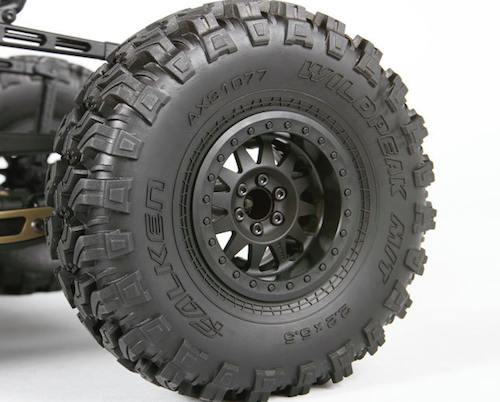 Axial’s Universal Axle Set is also an item to have at the top of your list. Other aluminum upgrade parts can be added as parts fail or show excessive wear. 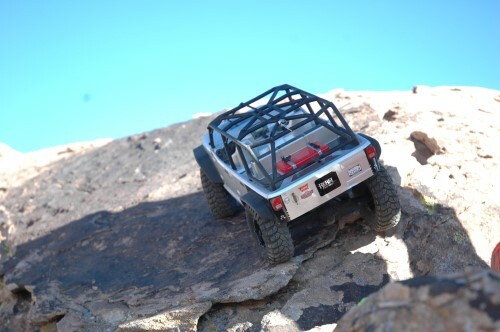 Optimal ground clearance will vary depending on the track, but you will want to get your rock racer as low as you can without making it impossible to navigate the rock portions. Scraping and dragging is okay. 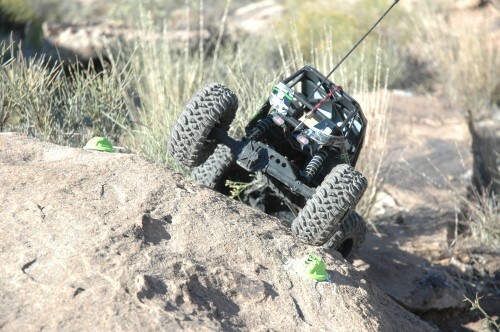 A lower will vehicle is more stable and less likely to roll in corners, on rocks and when taking jumps. Few crashes means less waiting for corner marshals and much faster laps. The fastest car isn’t guaranteed to win in rock racing. While you don’t want purposely make your vehicle slow, don’t worry too much about having the fastest vehicle on the track. 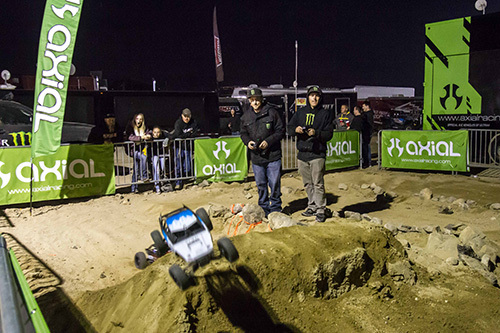 Stability and durability are far more valuable in rock racing than speed. 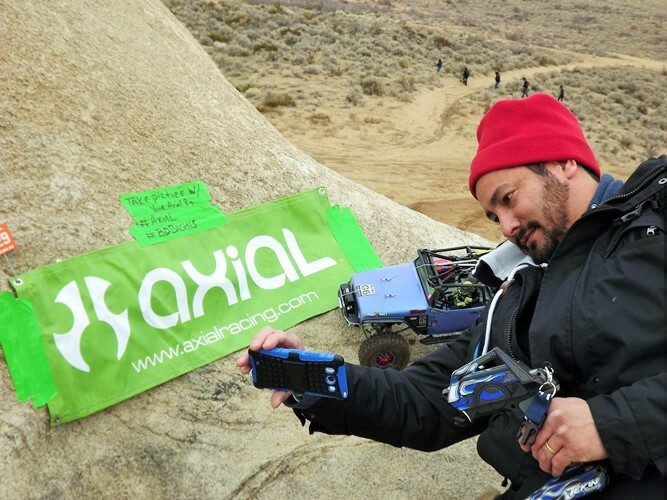 Axial’s brushless setup are more than fast enough for rock racing. 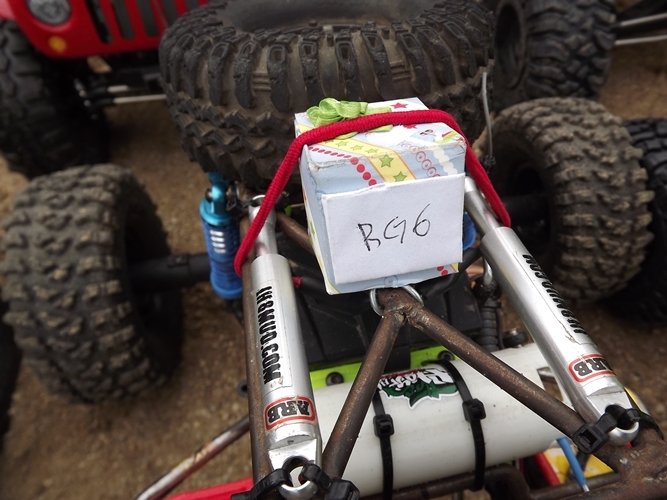 Some classes allow 3S LiPo batteries, which will provide a significant speed increase. If the track has a good amount of high-speed sections, running a faster 3S setup may be ideal. 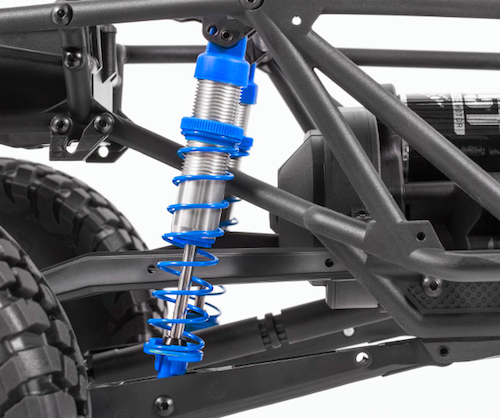 Axial vehicles all have highly adjustable suspensions. While you can change internal shock components such as pistons and oil viscosity, a lot can be done to dial in handling by simply changing shock springs. 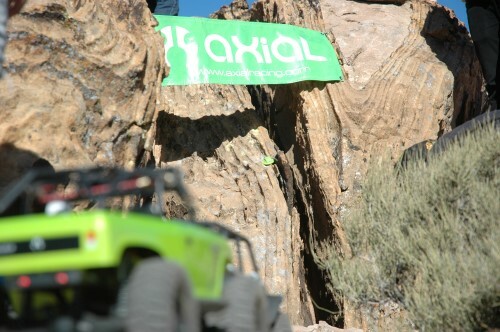 Axial offers a wide variety of springs in both firm and soft rates. The goal is to have a plush suspension. Most rock racers are setup with overly stiff suspensions that don’t absorb impacts well. You can see these vehicles reacting to everything they hit as both ends bounce up and down without the suspension really working. 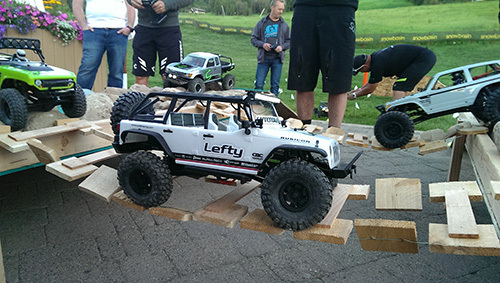 Setup up your vehicle so that it lands from a one-foot-tall test drop with no bounce. It should land as if there were a pillow under it. This may require experimenting with oil and pistons to get just right. Thicker oil will absorb more energy and keep the springs from acting like pogos and smaller holes in the piston will slow down how quickly the oil can travel through the piston and slow down how quickly the suspension compresses. This will help keep the chassis from slapping the ground. A little chassis slap isn’t a bad thing. You just don’t want hard hits. 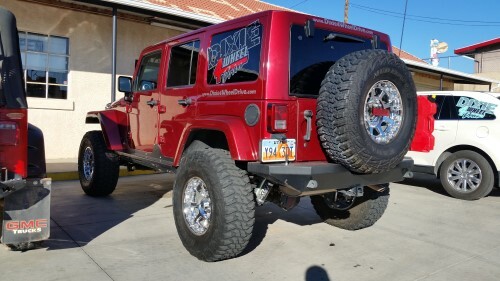 Use sway bars to compensate for this soft suspension. The sway bars will keep the vehicle from rolling over in the corners. 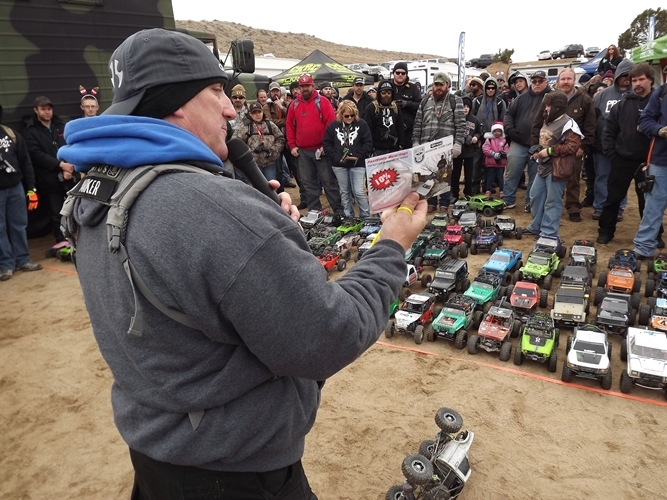 The biggest factor in how successful you will be at rock racing is you. Of course, you provide the driving skill, but what is really at stake is how well you take care of the vehicle on the track. There’s an old saying in racing that goes: to finish first, you must first finish. These words couldn’t be more true than they are for rock racing. Don’t let the other vehicles determine how fast you go. 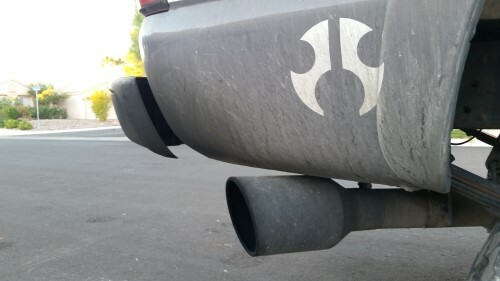 Know what your vehicle can handle without breaking or crashing and stick to that pace. If a vehicle passes you, do not chase it down. Pretend you’re the only vehicle out there and concentrate on nothing other than consistent, crash-free laps. Posted in NEW TO R/C? 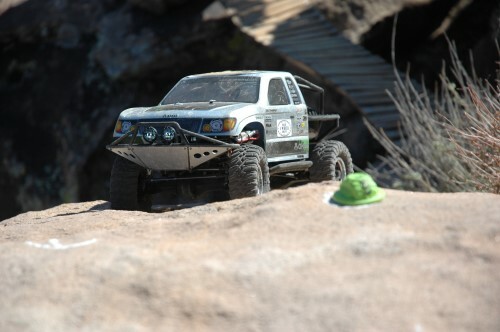 Straight out of the box, the Yeti Trophy Truck features gearing (16T pinion / 64T spur gear) best suited for extended run time on a 3S LiPo 5000 mAh battery. 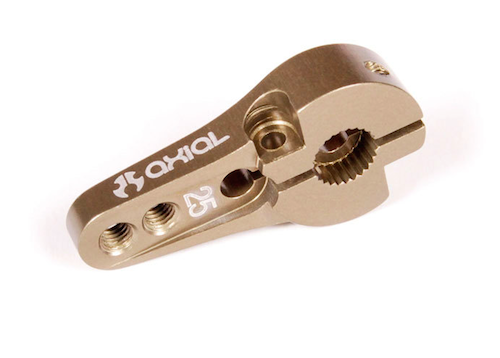 While this gearing yields a healthy amount of run time on both 2S and 3S (perfect for extended outdoor adventures), as customers, we are always looking for MORE SPEED. 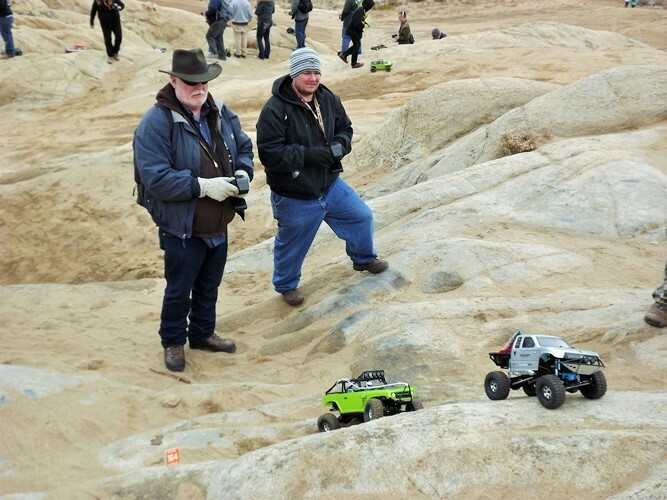 This is likely due to the fact that once people experience just how capable a Yeti Trophy Truck is in the wild, the tendency to want more speed becomes an overwhelming thought. 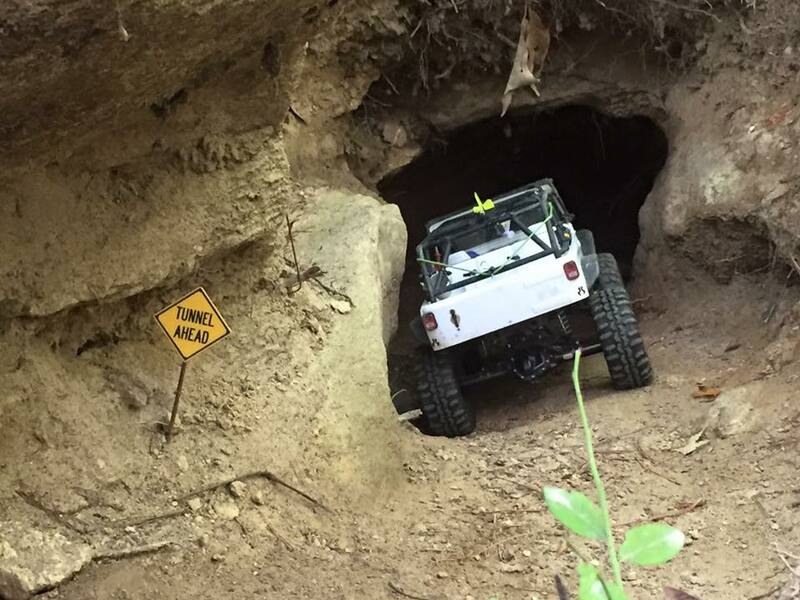 Truth is… it can handle more, although more than what Axial offers with regard to available pinion gears. The largest pinion we currently offer is 17T (AX30843 Pinion Gear 32P 17T – Steel (5mm Motor Shaft)), which will give you more speed than the stock 16T pinion gear, but not much. Please keep in mind that going with pinion gears higher than 21T will put more strain on your motor, resulting in potentially dangerous higher temperatures. 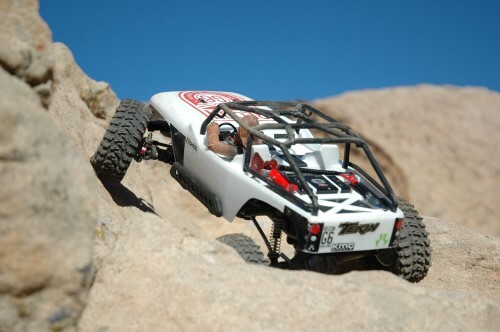 For our test, we used a Robinson Racing 21T pinion gear (http://www3.towerhobbies.com/cgi-bin/wti0001p?&I=LXDZFG&P=7). The morning of Saturday September 19th began with a drive into the Foothills of North Carolina. 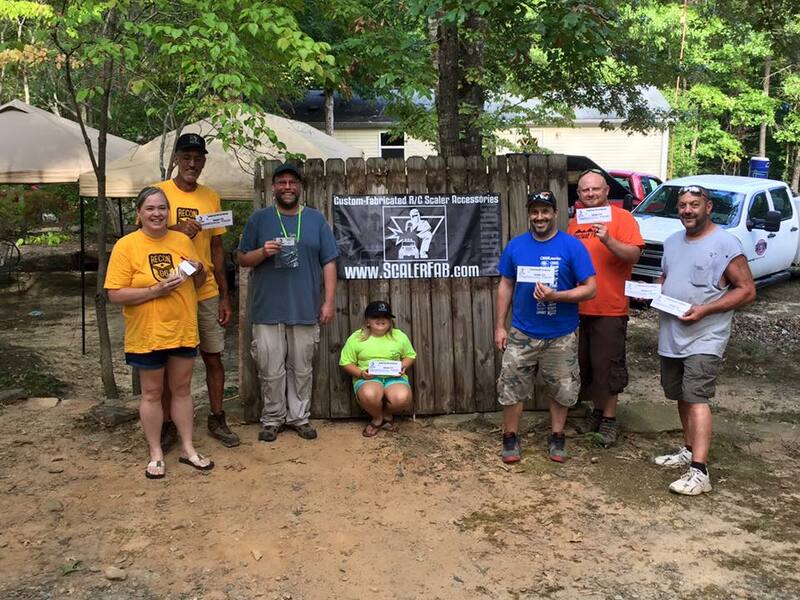 The road going into the land of Knobby Creek was a crawl for some of our arriving sedan drivers. As the crowd began to gather here, the energy was buzzing. For many of the drivers this was their first G6 style competition. 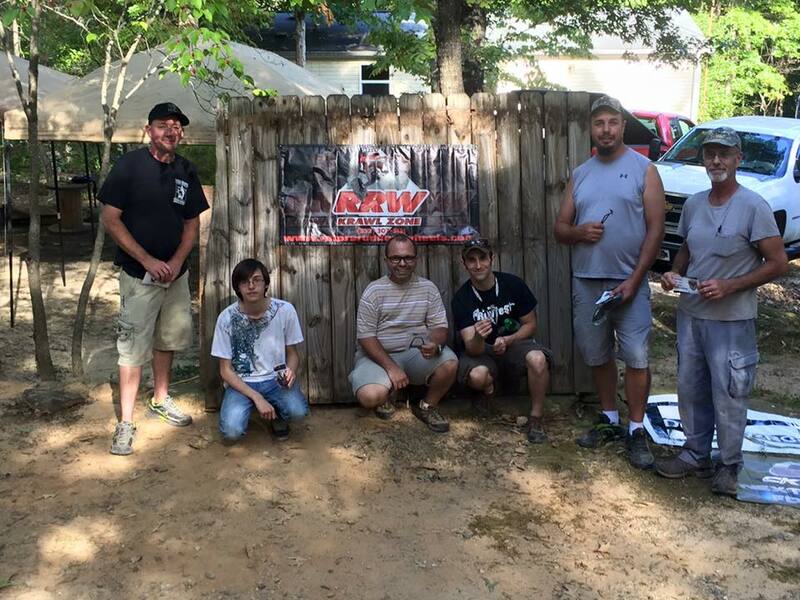 The main objective was to give some of our new members a chance to see how and understand the meaning of the infamous RECON G6 events. 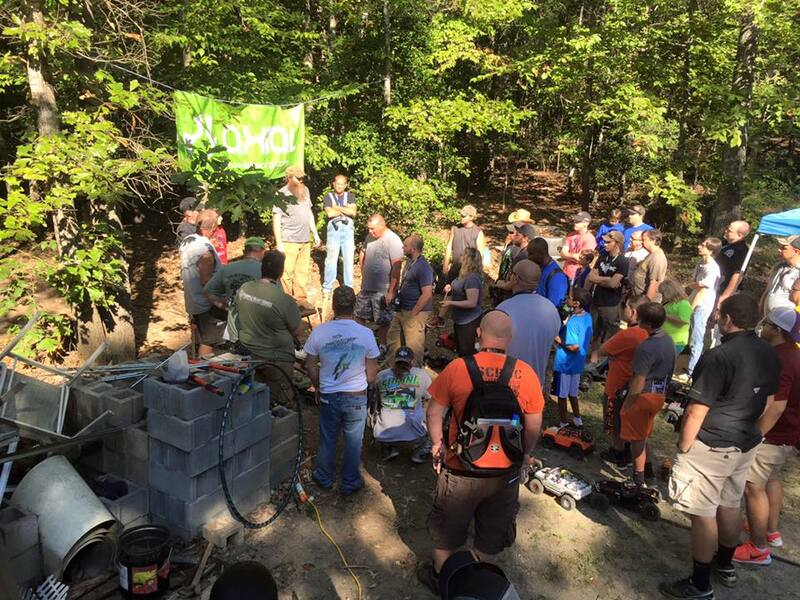 The ”Knobby Creek Pre G6” was put on by none other than the Carolina Crew. 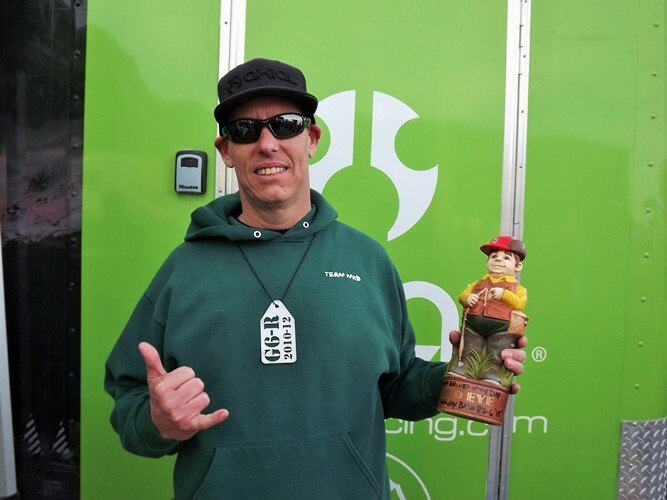 Both Shawn Barton and Todd Knopp put countless hours into making this event happen. 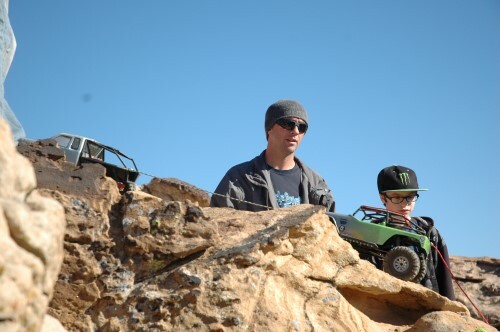 A big thanks to both Ronnie and Thomas Shaffer for all the work creating this magnificent Crawling Course! 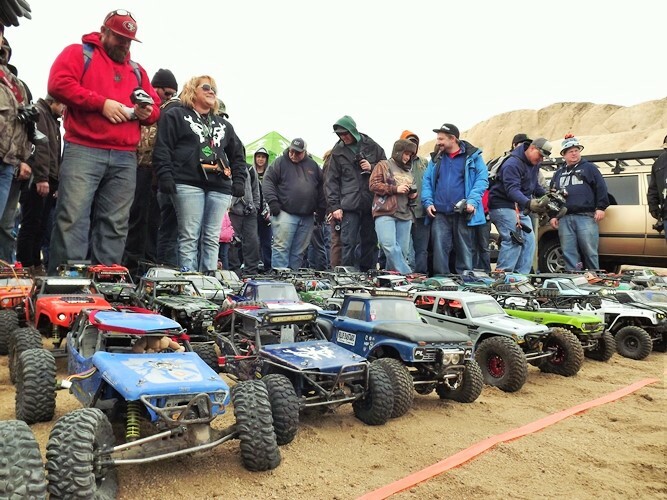 As the last folks arrived and driver check in was completed, the excitement and anticipation was thick as all 46 drivers gathered around for the Drivers meeting. First things first was a shout out to all that came new and old. 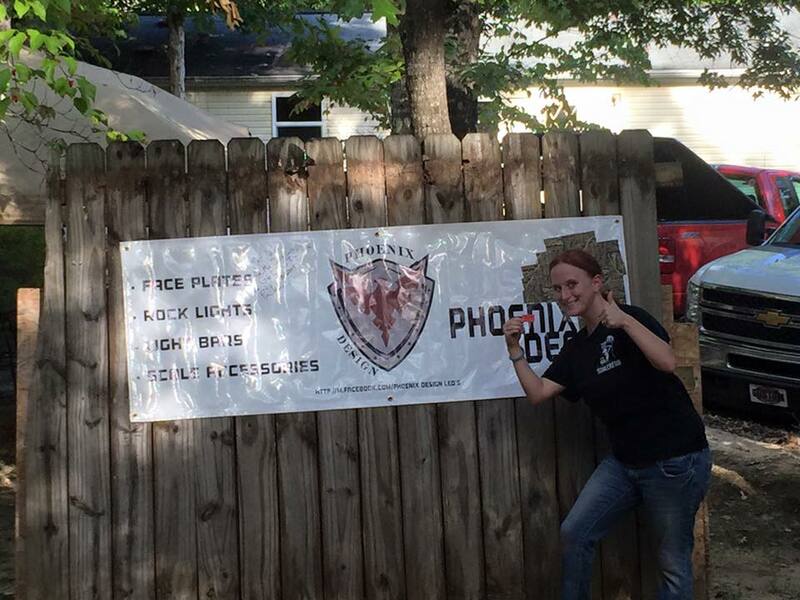 Shawn was sure to let everyone know that without the help from our sponsors the event would never be the same. 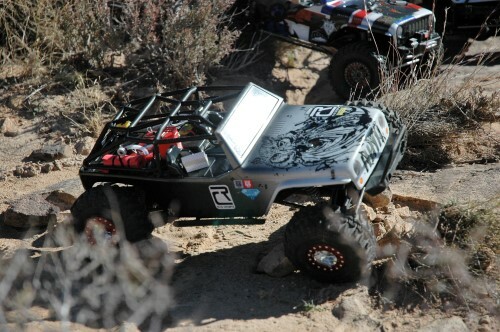 So we gave thanks to Axial, RRW, Rivas Concepts, CKRC, TheKhatel, ScalerFab, Team KNK Hardware, CBERCFAB, Phoenix Design LEDs, and Creative Media and Design! Covering the event rules is always simple: no HOG (HAND OF GOD). 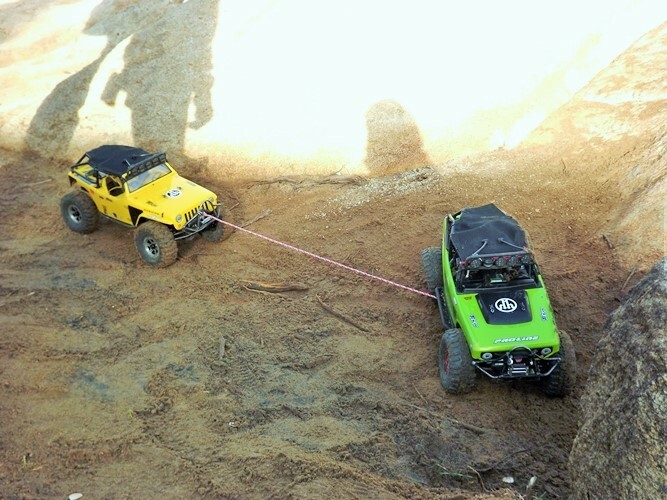 If stuck and no one can help you, a penalty winch is allowed. 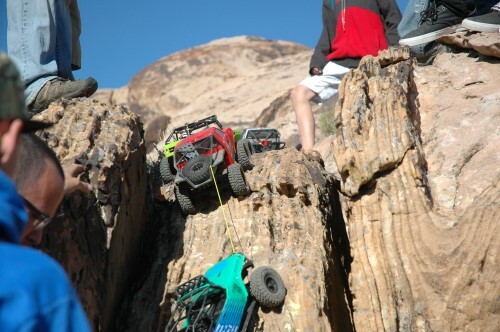 Mark your hit gates and penalty winches and last but not least HAVE FUN! 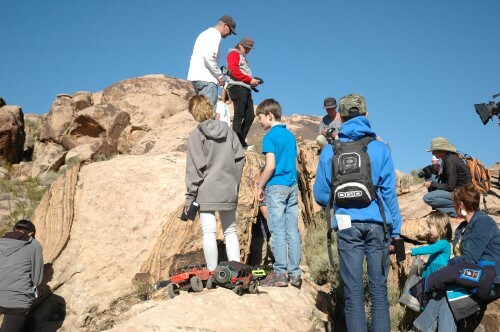 The 46 drivers were then separated into 4 groups: A, B, C, D. These designate which trail they would begin on. The clock was started and the groups were released one at a time to ease any bottlenecks! Right off the bat drivers were met with a blind tunnel that was hand dug through the ground. There were a few of these tunnels around as it seemed the land had been mined by trolls at one point. One part of the course that had just been erected, known as the “Zoo” (as spelled in all dictionaries) began with a hollowed out log that the driver could either use a tunnel to ascend onto the canopy bridges or crawl the topside of the log to the top, if you dared. 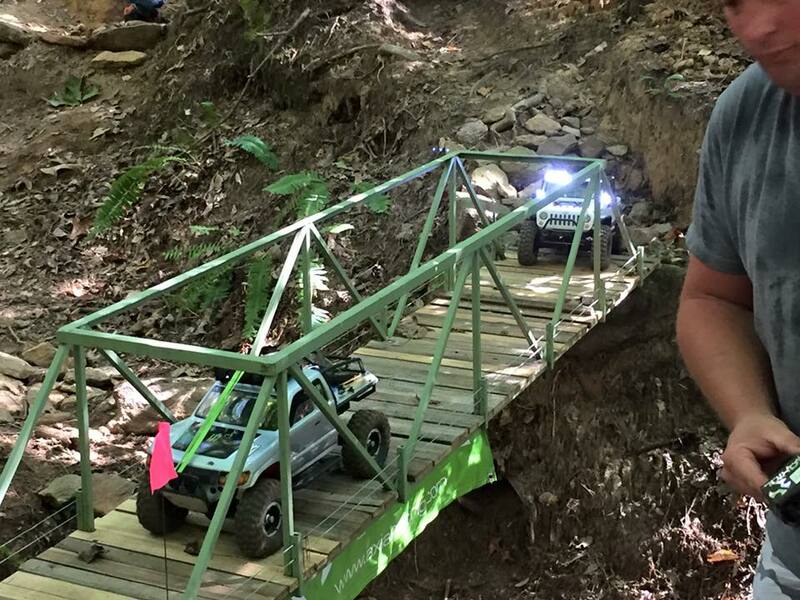 Soon the drivers found themselves negotiating waterfalls, and many different bridges including a nicely done scale steel bridge. 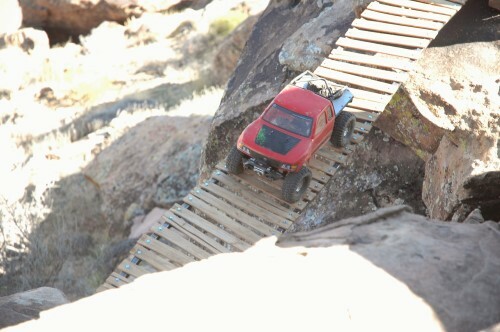 This bridge soon led to a section where each driver was forced to drive in reverse for a marked out section of the trail. Teaching the drivers to use reverse and look outside the box at different lines. 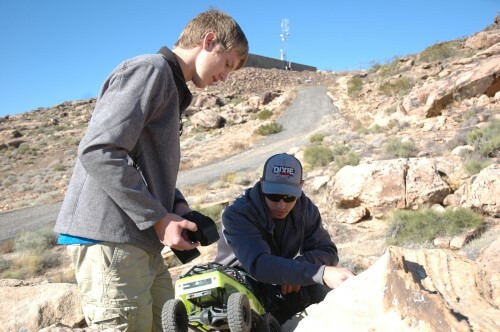 After each section was completed, the drivers returned to “G Central” where they had to complete 1 of four driver challenges before moving on to the next stage. The first challenge was a Frisbee toss into drum. Being an avid disc golfer, this looked easy… Not quite the case as the frisbee being used was no golf disc for sure, and many struggled to get this disc to fly in any predictable way. The second challenge was a ping pong toss, set up much like a beer pong table. The competitor had one ball to toss and each cup had a different point on the bottom to be written on the score card. 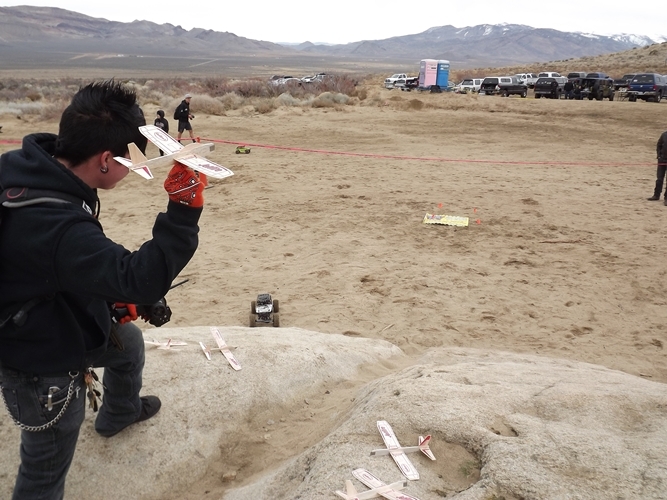 The third challenge, each competitor blew up a balloon that was given to them with their score card and pinned it to the fence. Then they were given a dart and had to count the tosses until the balloon was popped. The forth challenge was a truck pull. 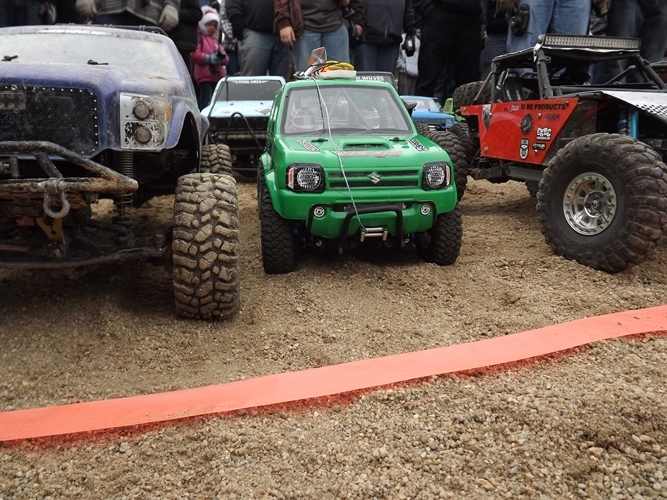 The toy truck was weighted down with a large piece of metal in the bed and was much too heavy for most rigs to pull. 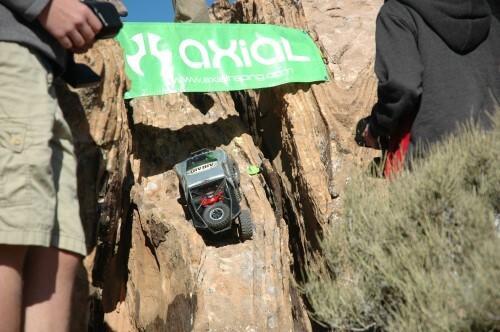 This challenge was like many the competitors would face at a RECON G6 event, where in it paid to think outside the box. 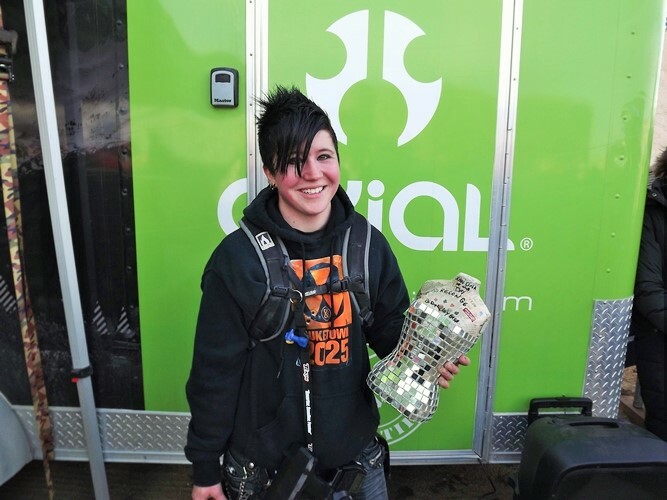 Only those who teamed up and strapped their rigs together were able to pull this beast across the line. As competitors finished, the cards were turned in and the scores began to get tallied. While they waited for the results the group moved over to the Bounty Hill section. 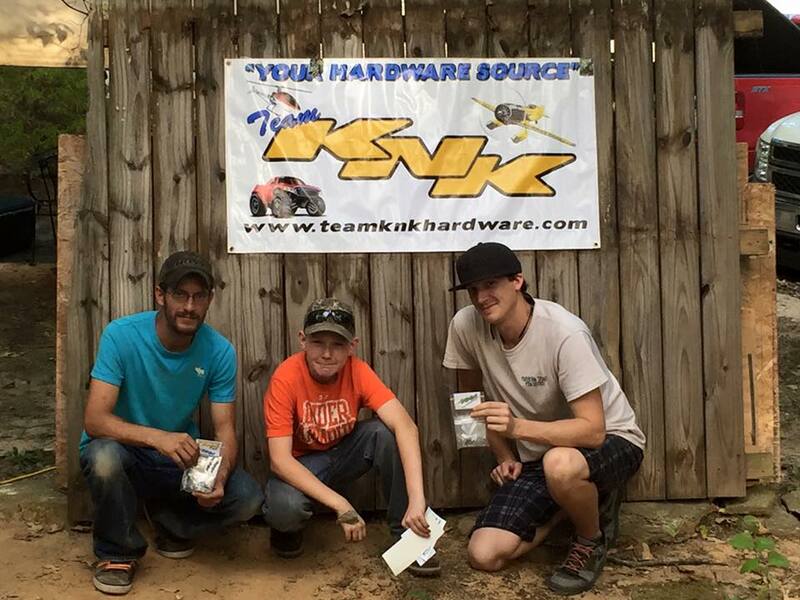 Run similar to the CKRC Dollar Dash at AXIALFEST2015, each turn was a dollar and the winner got to take the pot! 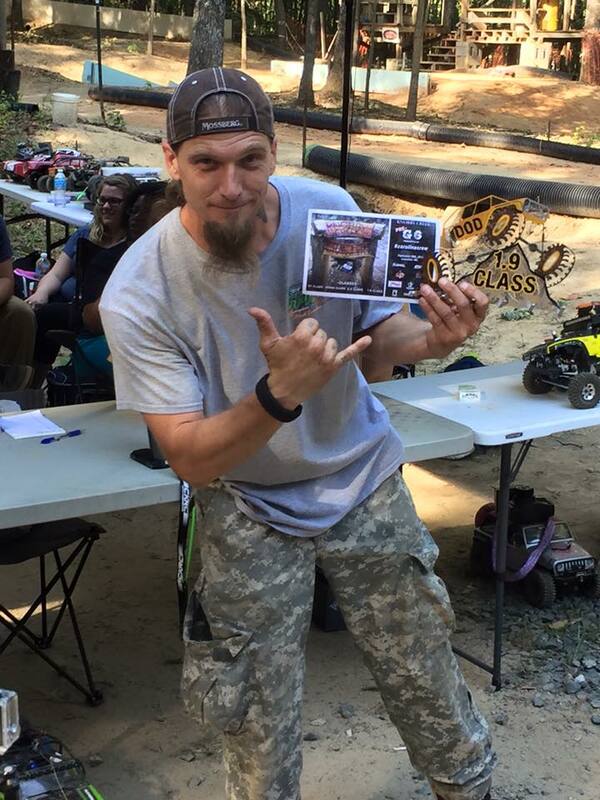 After many attempts and few finishes, Mr. Dawson Lovette was crowned the fastest! The day was coming to a close which meant only one thing: awards and raffle. Again, thanks and praise was given to all the sponsors and competitors for their efforts in making this such a great day! The 2.2 Driver of the Day was awarded to Mr. Nico Robert. 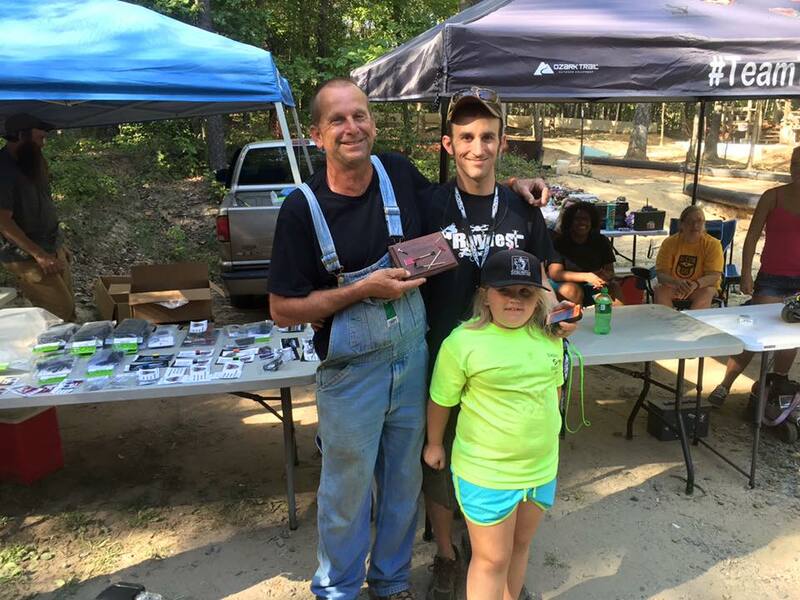 1.9 Driver of the Day was Mr. Nathan Faircloth. The ST Class Driver of the day was Mr. Jeremy Hope and our Driving Diva of the Day was Mrs. Kimberly Traylor Delcambre. 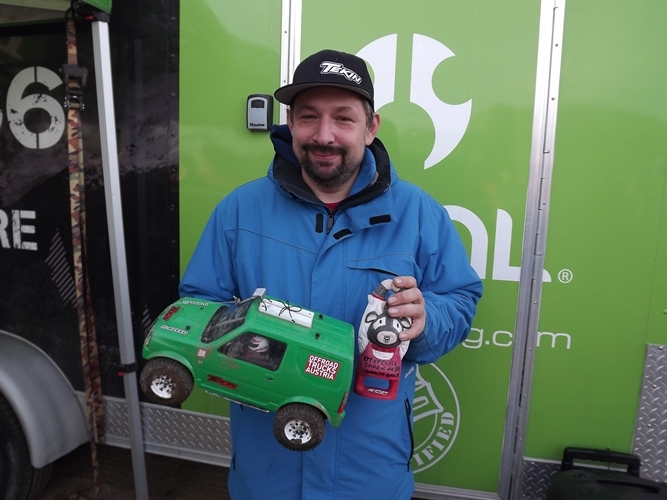 Last but not least, there was a very small Axial green spider that was hidden on the course and found by our furthest traveling competitor Mr. Shane Barton (Team Fear the Beard), who was awarded a Axial NuKizer body! Then the raffle where every participant left with a prize. 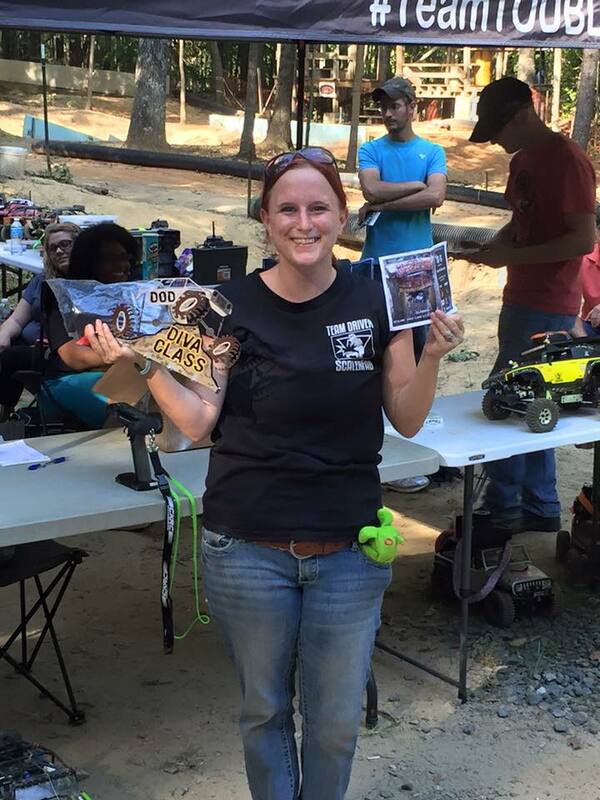 As a surprise to all of the competitors for coming out, one last item was raffled off. 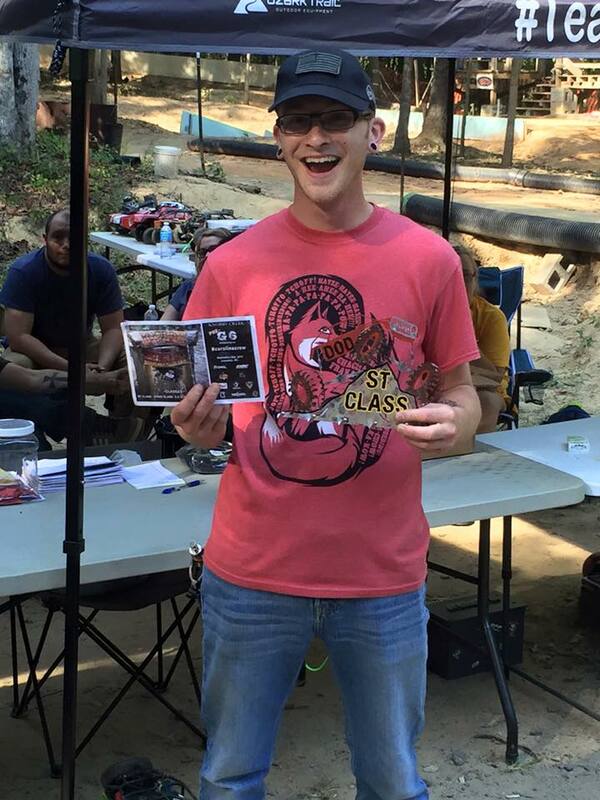 And the winner was Mr. Josh Carwell! 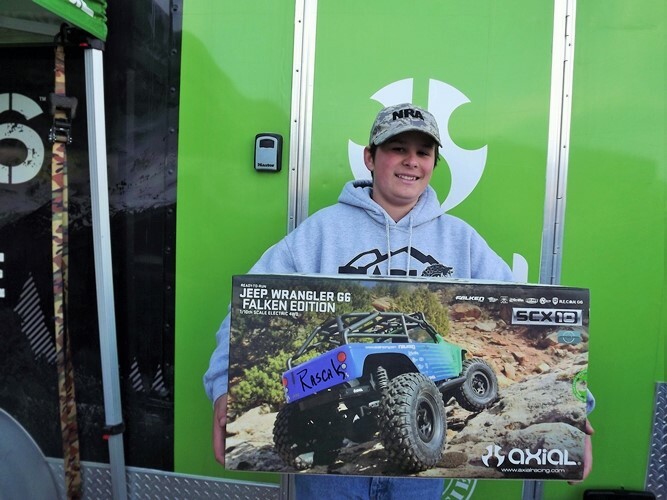 He won a new Axial Wraith Spawn kit! In the end a great day was had by all. 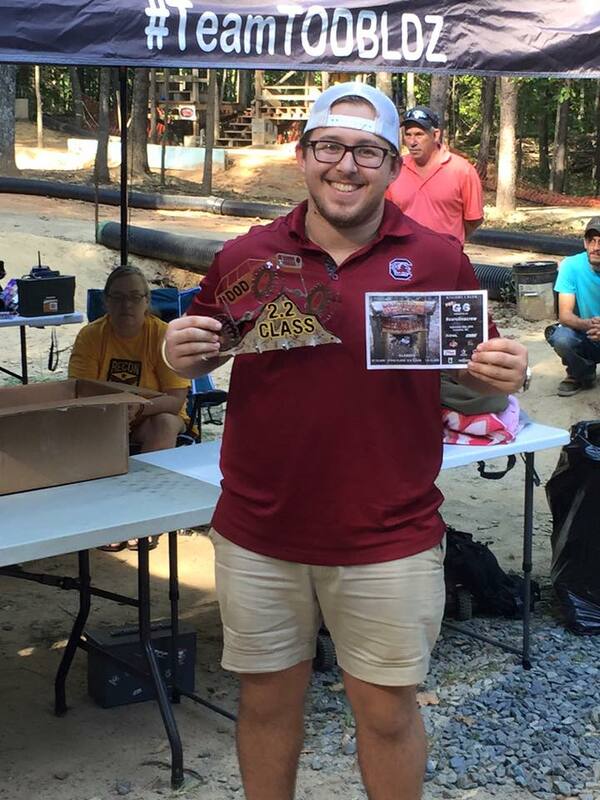 Thanks again to all that continue to support the Carolina Crew! 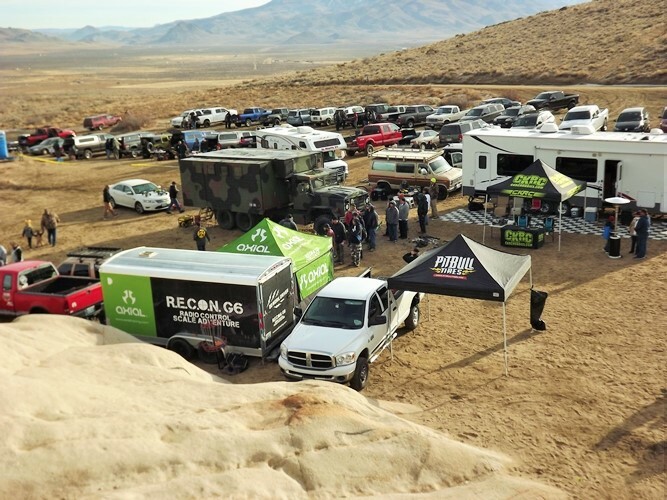 December marked the 5th anniversary of the RECON G6 Challenge and Brian Parker and the RECON G-crew returned to Reno, Nevada for the RECON G6 Challenge B’DAY Bash! 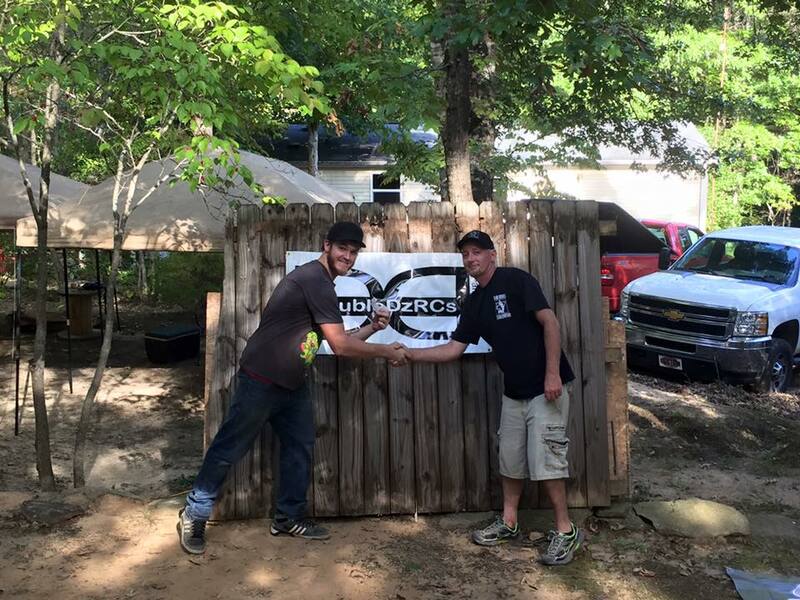 The RECON G6 Birthday Bash was again held at MOONROCKS. This is were I personally cut my “crawling teeth” with a 2.2 shafty way, way, way back over 10 years ago! This is also the location where I first met Brian Parker and experienced his magical ability to make everyone feel welcome and have a great family friendly time. Next to G-Central is what really caught my eye. This was a 5 ton military command headquarters! In its retired life, it is now utilized as an privately owned overlanding beast. 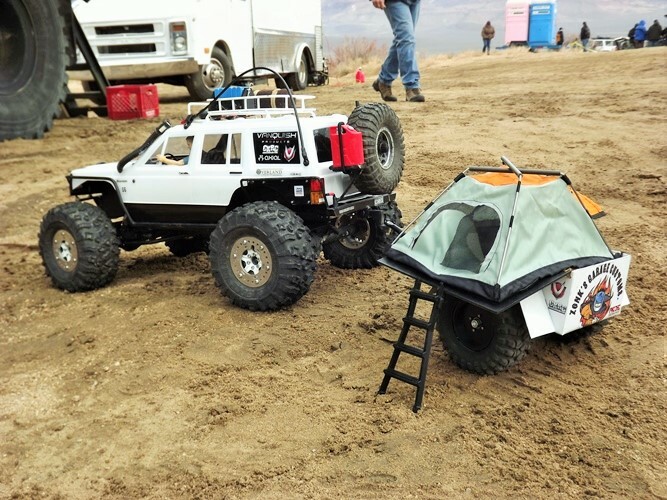 The Meeks family uses this for their off-road camping and exploring adventures. Look for more details in an upcoming blog! 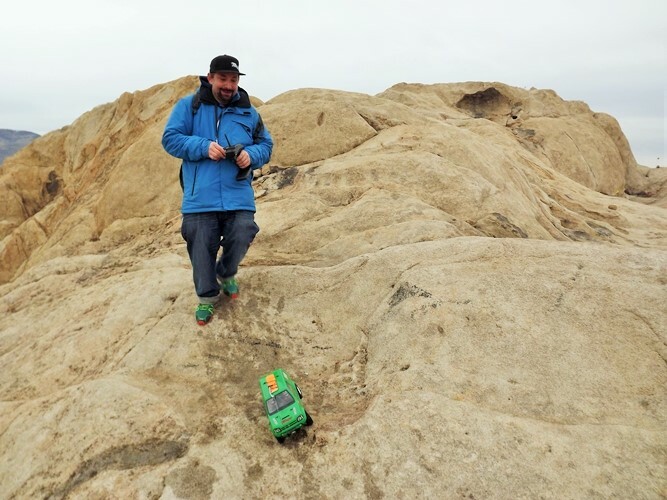 Elio Dianda, aka the King of Scale, brought out a new rig and overland trailer. 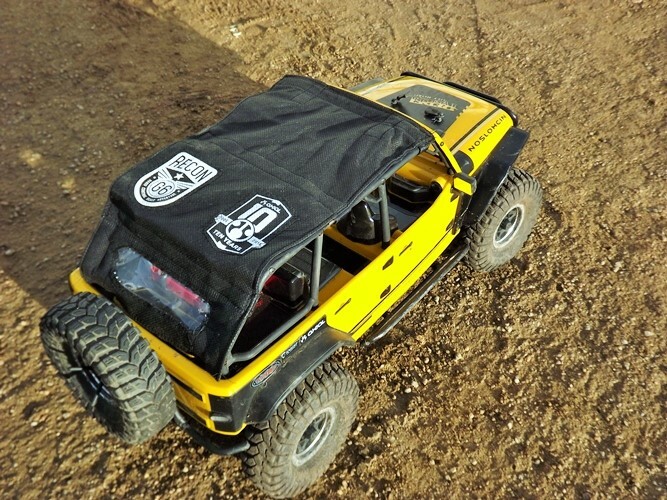 Do you have a roof top tent on your kit? 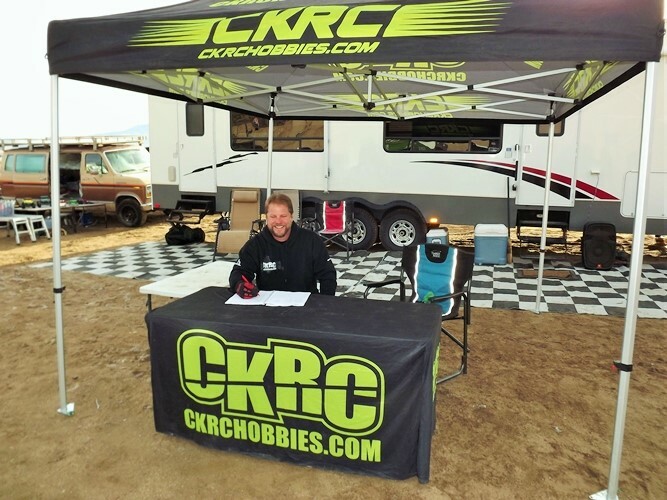 With R/C industry folks in attendance, Reno-local Jason Copeland from CKRC Hobbies came out. 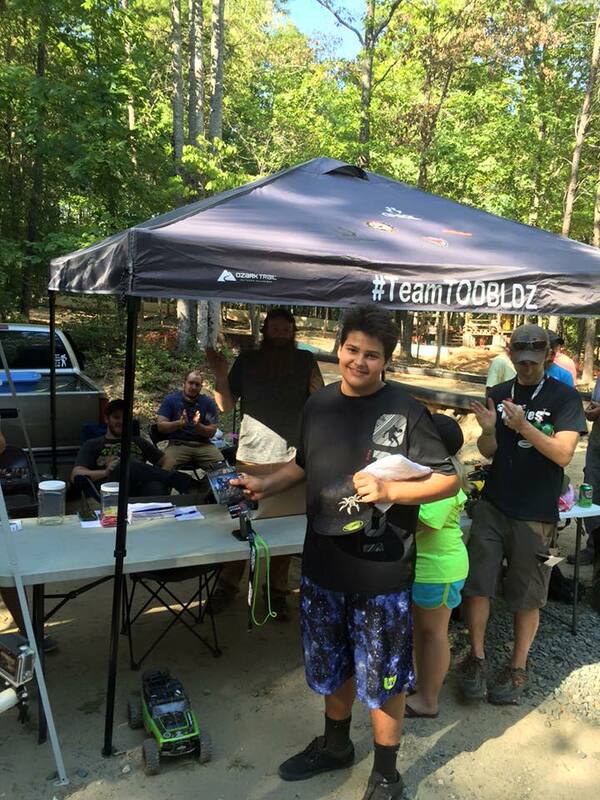 Here he was getting people checked in for the UAR race that was held after the RECON G6. 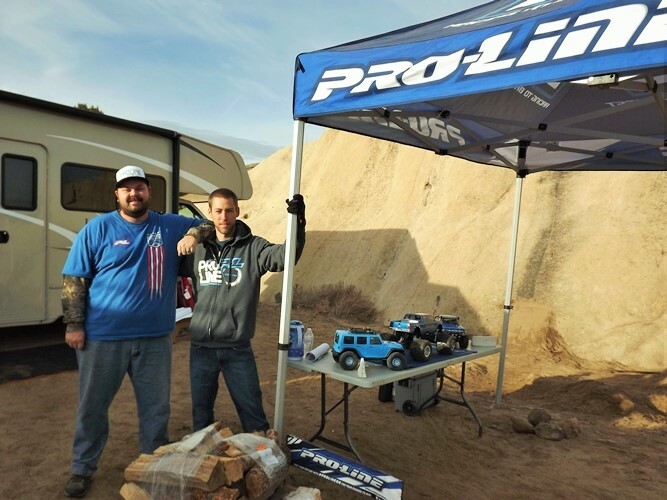 The boys from Pro-Line Racing were also in attendance. They made the drive up from SoCal to get their G6 on. 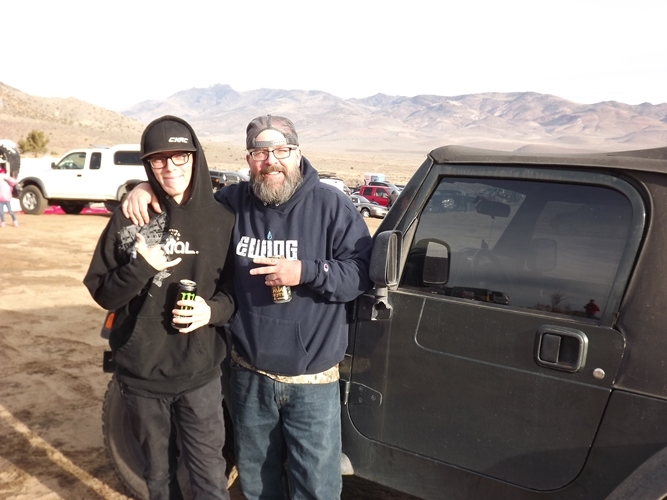 Cole Bailey brought the OG Crewman Brad Bailey, aka SadBrad, out to celebrate with us! It was great to see HappyBrad back after three years! 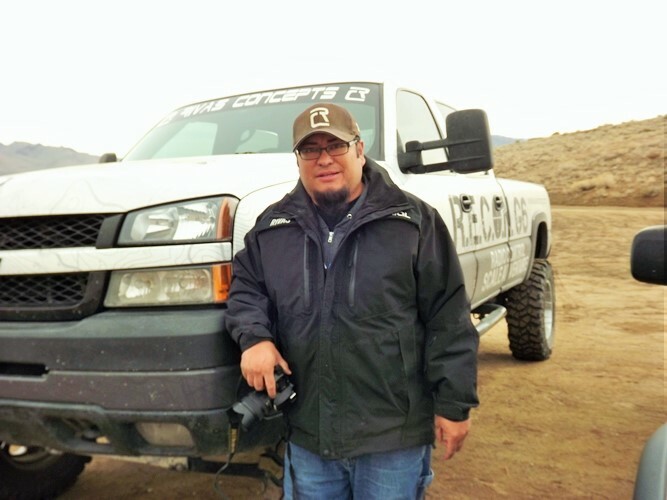 Anthony Rivas of Rivas Concepts made the trek up from Las Vegas to party. It was great to see him. He was my road dog on our trip to the first Canadian G6. Wertymade’s Werty, aka Matt Henry, was also in attendance. He makes some awesome bumpers. He even burned some midnight oil for Austrian Daniel Siegl. 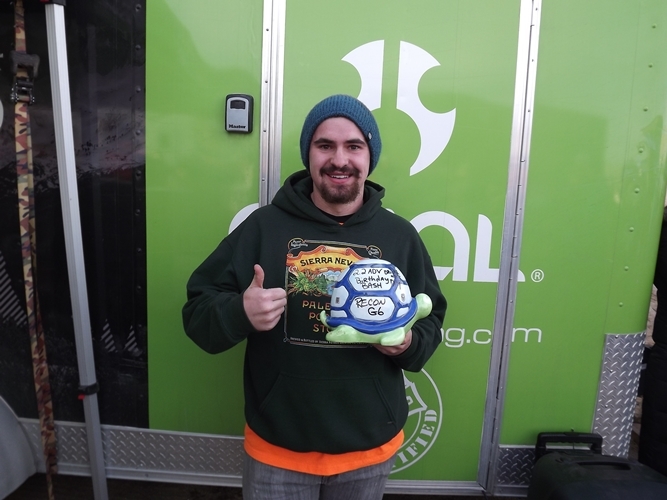 Daniel needed a bumper for his 1.55 rig, so Werty made the over 100-mile round trip to his house to quickly fabricate a custom bumper and get it returned the next day for the Birthday Bash! His bumpers are also the #officialbumperoftherecong6. 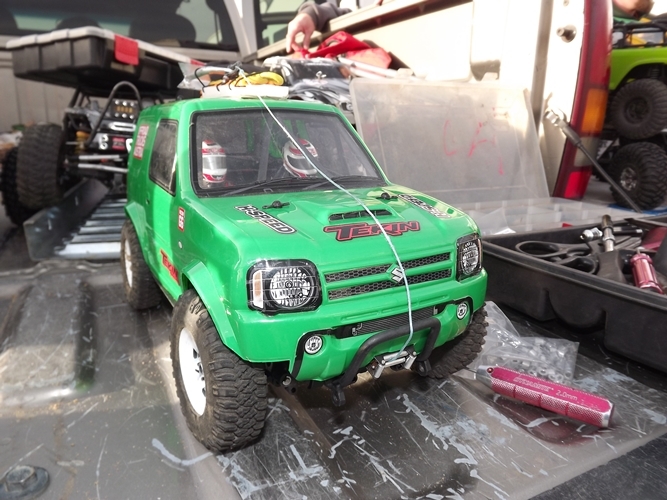 Here’s Daniel’s tiny 1.55 Suzuki Jimny with the Wertymade bumper. It fit and looked great on this little wheeler that could. I spotted the coolest top ever. 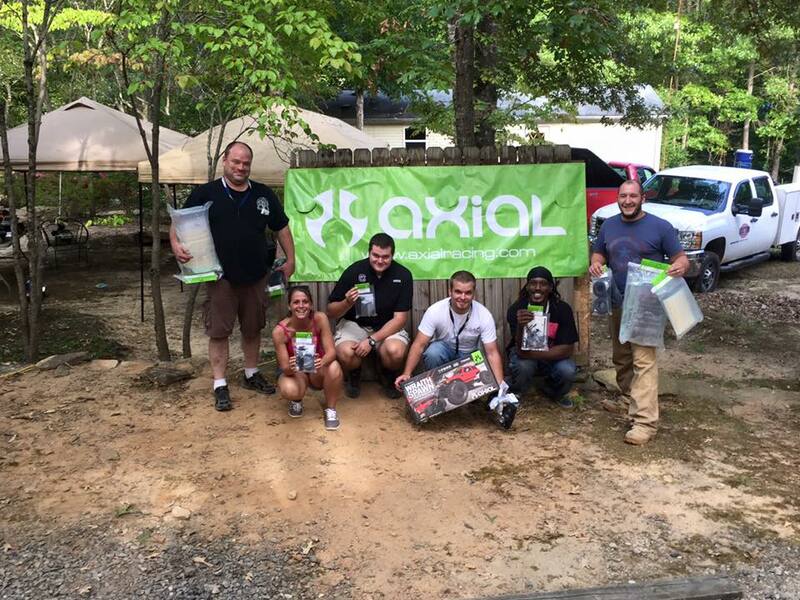 What did you do with your AXIALFEST 2015 swag bag? This guy made a soft top out of his! I already talked to Mama Skeeno, so look for a future blog on making one of these as well. The parking lot began to fill up as people started to show up down at G Central. 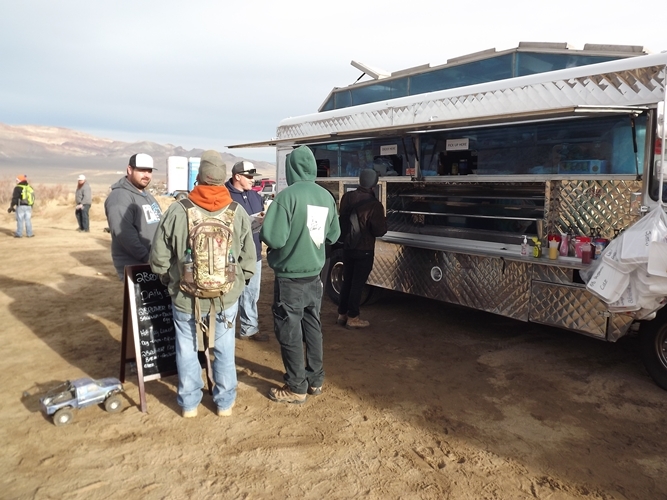 Several people wisely brought out their campers to stay warm in. It was nippy, only getting just above freezing all day. 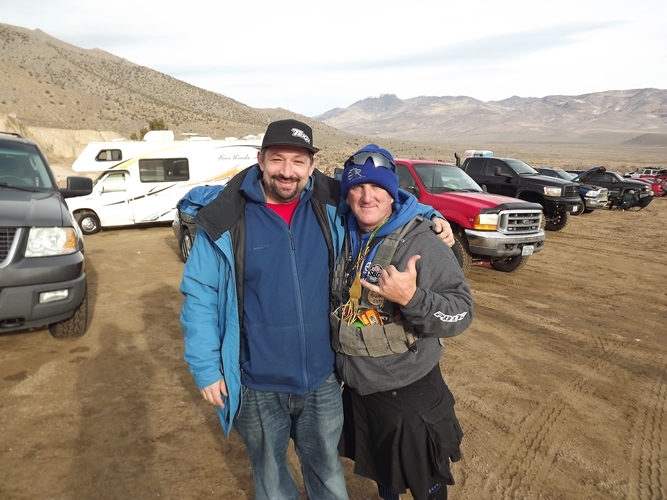 There’s the crazy Austrian, Daniel Siegl along with Mr. RECON G6, Brian Parker. I caught them just long enough for this picture before they rushed away in different directions to finish setting up. 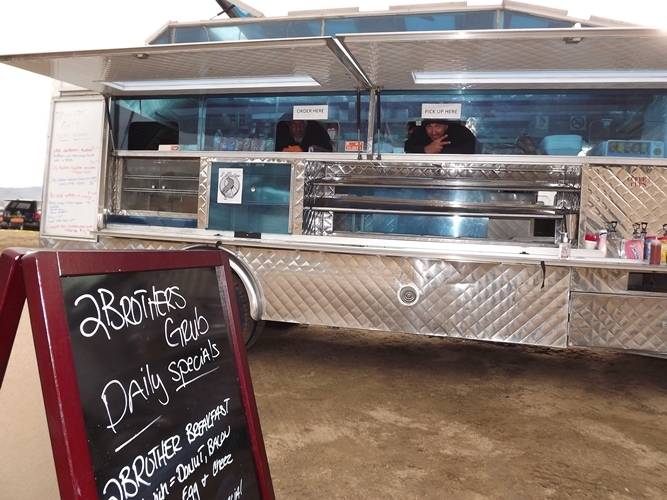 2Brothers Grub brought out their catering truck for some hot meals. I was excited about this, no Mountain House for me today Mr. Rodney “Mountain House” Wills! These ladies did an incredible job running G Central all day. 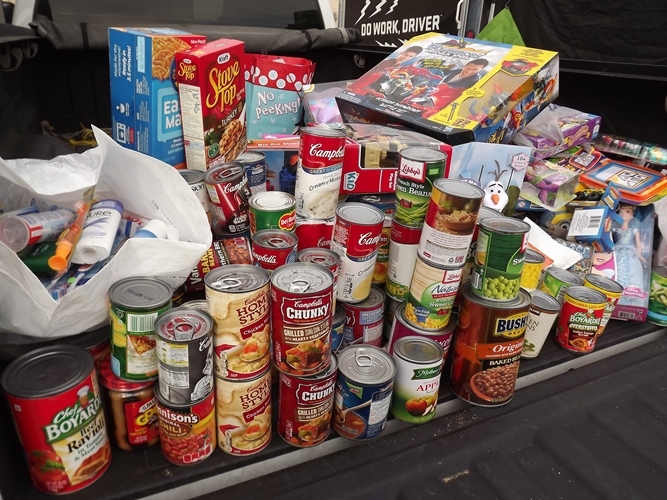 Since the Birthday Bash is in December, RECON G6 collects toys and food to donate to the local food banks for the holidays. 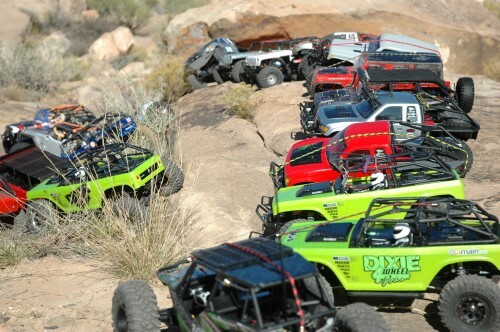 My favorite part - the rigs got lined up! Requisite group shot. Let’s play Where’s Parker? Can you find him? There he is in the middle giving the instructions at the driver’s meeting. Parker goes over the driver’s log books. 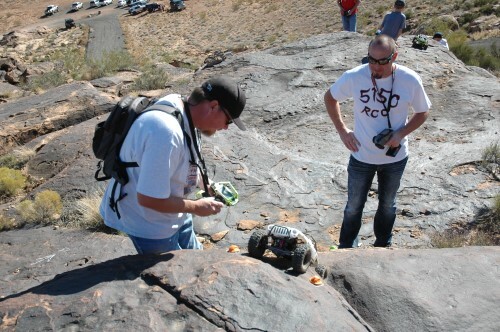 Make sure you mark everything you see and do at a RECON G6. It could gain you a bonus. 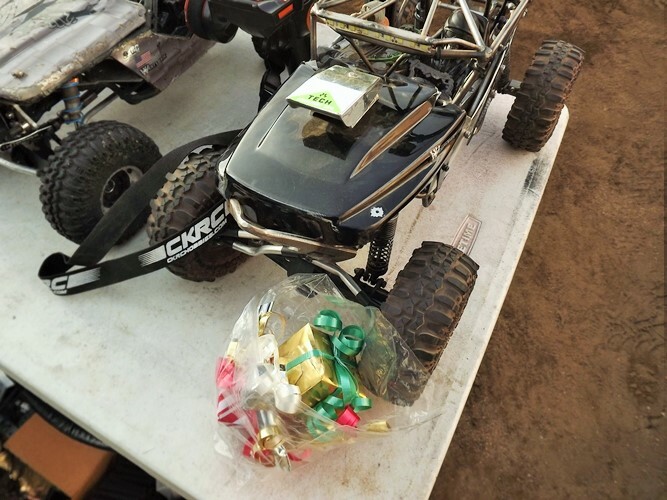 Lots of rigs had presents on them. This guy brought a present for Cinnamon. I hope it was a working alternator. Its about the right size! This rig had a full sack of presents. Also, check the AXIALFEST 2015 Tech sticker on the hood. 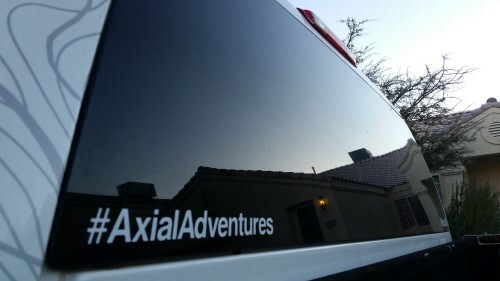 Do you have a tech sticker from AXIALFEST? 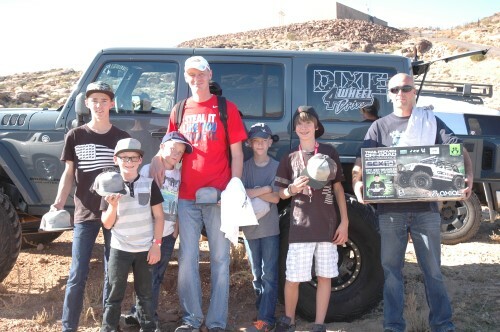 All the cool kids do, so make sure you are free the weekend of July 15-17, 2016 for AXIALFEST 2016. Someone brought a scale Yeti XL. Do you even paper craft bro? Here’s three different paper craft projects to occupy your free time over the holidays. Daniel’s Suzuki Jimny 1.55 looks tiny next to the 1.9s and 2.2s. Do work, little guy. #tinybutmighty or #mightytiny your pick. After the National Anthem, it’s GO TIME! Light your lipos! I had to make sure Dan W. got a photo. Here he is waiting for Mike Pham to get out of his way. These two are friendly-fierce competitors! THIS IS WHAT IT IS ALL ABOUT!!! I always love to see the little ones out on the trail. Here a young lady puts a little body English into her driving. Ben Naputi, aka Mr. Fokai, is always easy to spot. His rig is always proudly flying the Guam colors. Wraith Spawn climbing to the overlook. 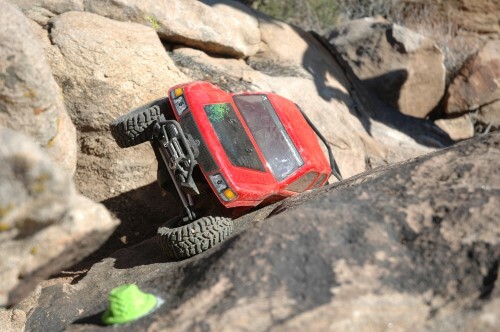 Old school SCX10 Honcho out leading the way for the new school SCx10 Deadbolt. 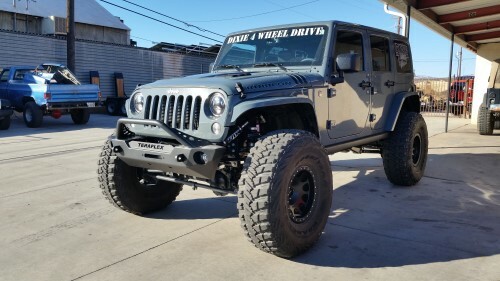 Great looking RECON G6 Jeep. 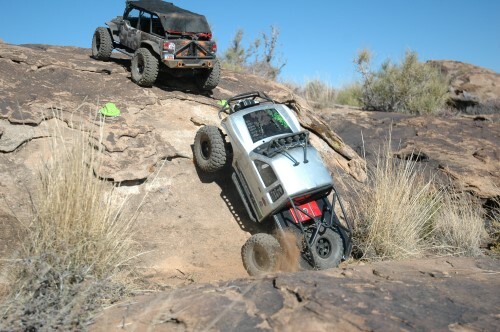 The Hoyfab Titan 6×6 waits patiently for this Chevy Blazer to finish its climb. Slow and steady gets the whole family there! 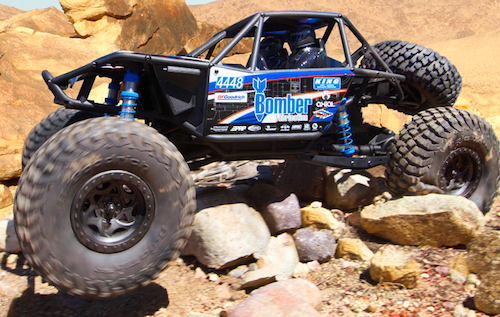 We got to see the new Axial RR10 Bomber out on the trail. It did awesome! Cody Knoll told me the longer wheelbase works wonders for stability. 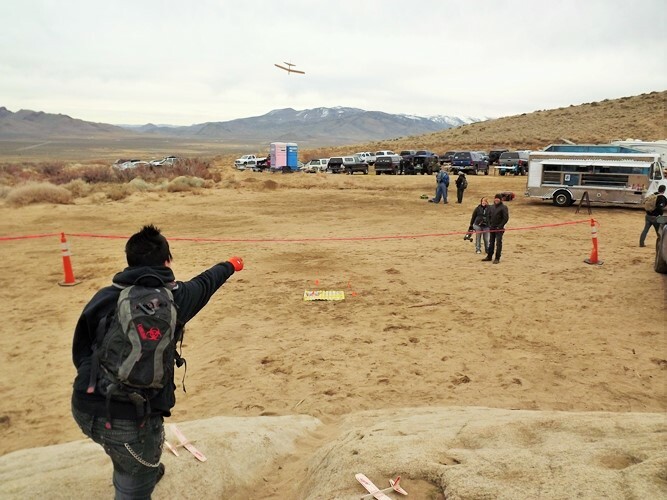 Real (full-size) or R/C? They are real – just real small. 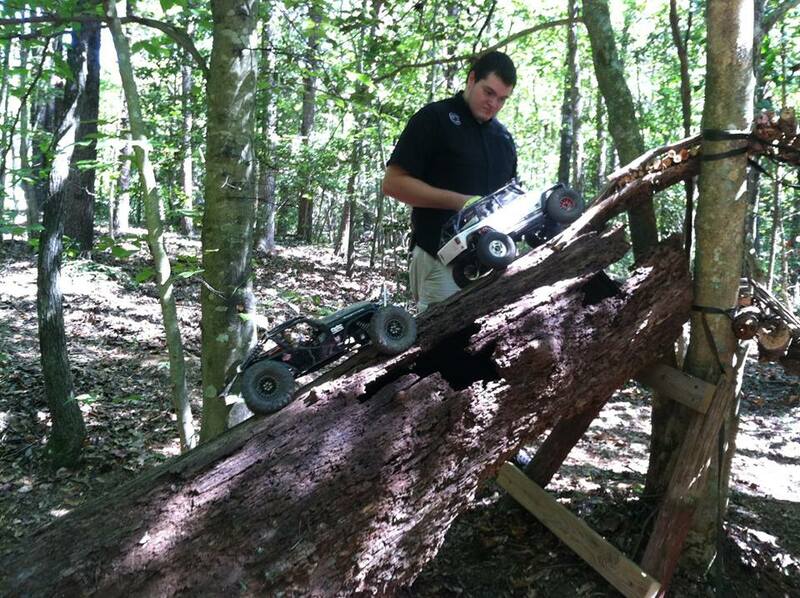 Real radio control rigs doing real trail work! Don’t forget your tow strap. You’ll need it to help out your fellow G6ers get stuck. Along with your tow strap, you should also bring tools and spares. 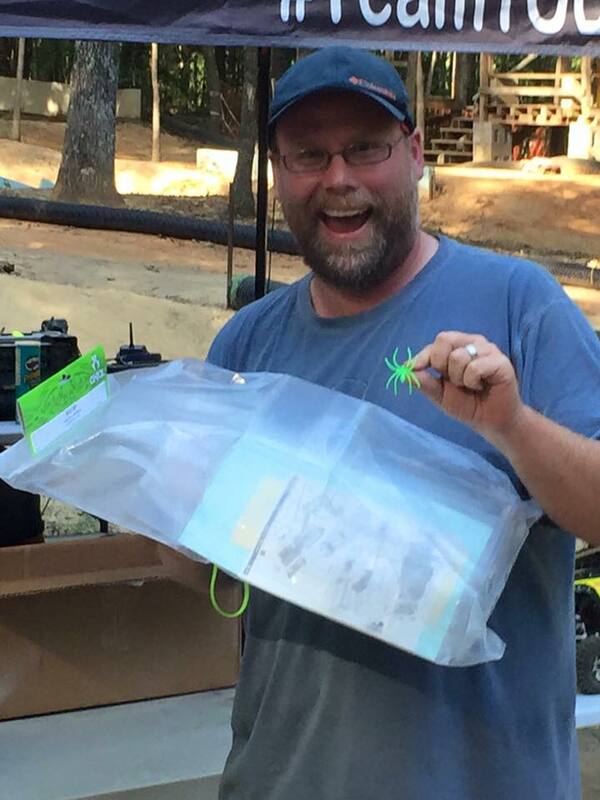 Being prepared for trail fixes keeps the fun rolling. 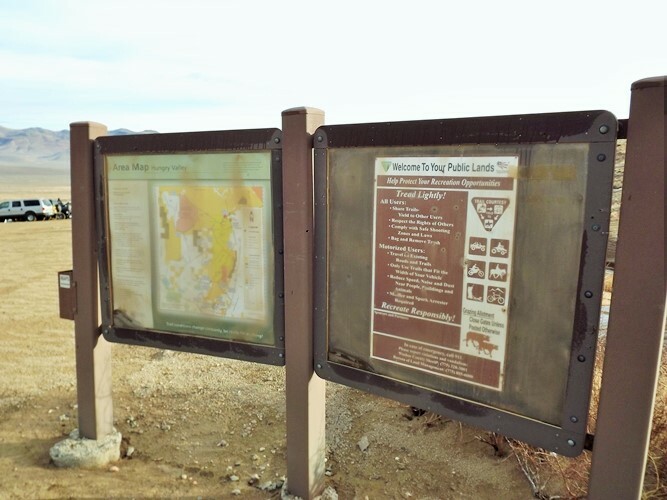 There’s no shame in making a field repair to get yourself back on the trail. 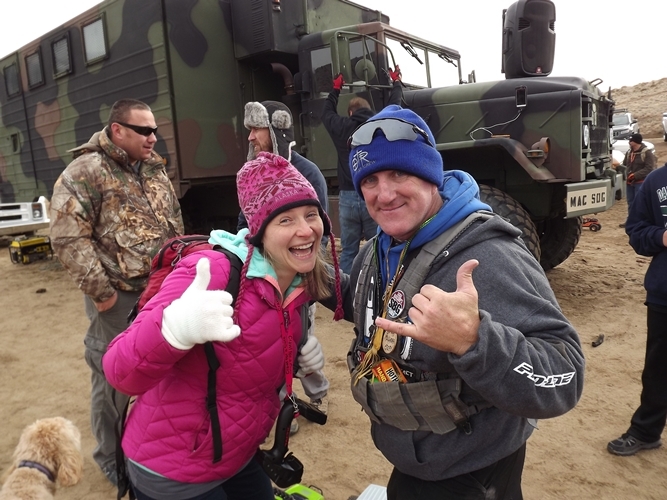 These two made it to the top and are headed across the plateau. Does this photo look posed? It took them forever to act naturally, so I could take this photo. 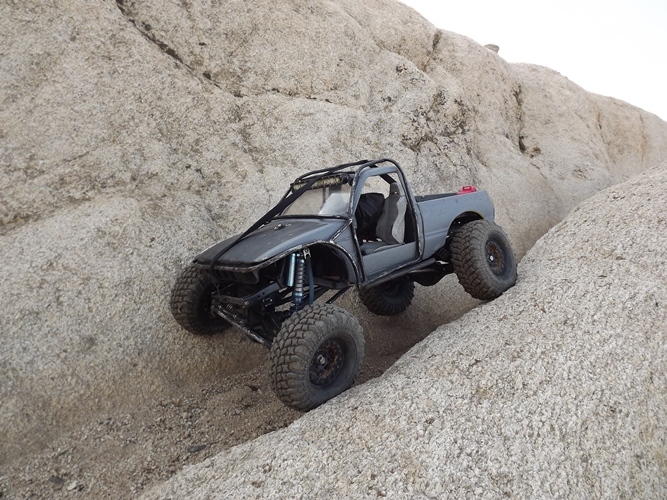 This Jeep three-wheeled up and did the magic roll back down to the bottom. Jesus wheels too! 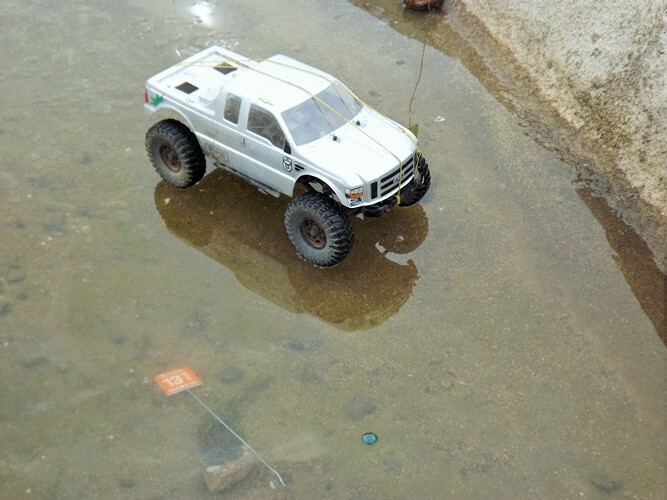 This F350 walks on water…errr, ice. Told you it was cold! Mr. Pham took this chance to spin some icy doughnuts. Mike Pham was feeling Phamtastic! Ed Duco also got his selfie on. Did you hashtag your selfie at #BDBASH15? 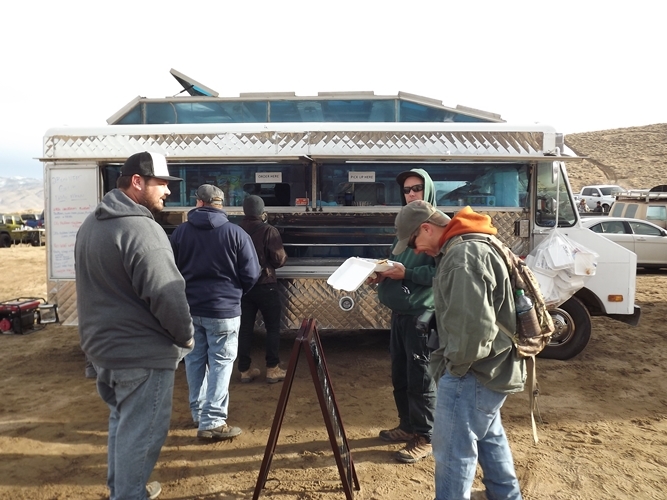 Once the 2Brothers Grub truck opened for business, the line started to form. 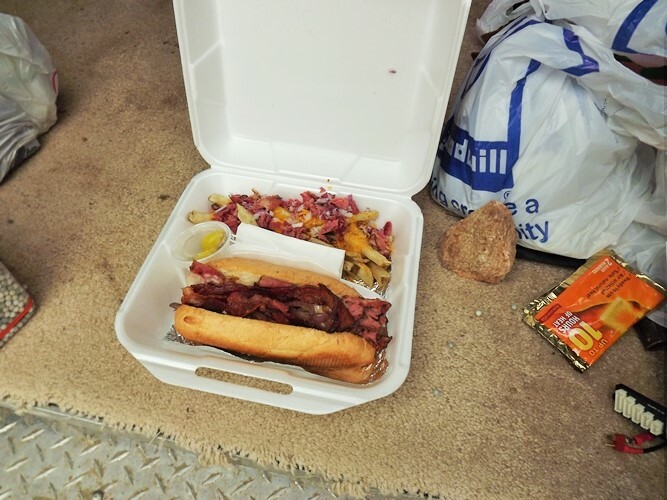 They told me to go with the signature “Gangsta Fries” with my Pastrami sandwich. Glad I did. It was delicious! Daniel feeling a little lonely with his lone 1.55er in the big wilderness. It worked pretty well for being so small. I’m sure the Wertymade bumper was quite helpful. I think this driver jumped out to water a bush. I hope he set his emergency brake. Back a G Central there were a couple Driver’s Challenges to choose from. Here a Recon Rascal attempts the Frolfing Disc Golf throw. He looks on target. Looks on target to me. Great form, Amanda Henderson, aka Gadget. Not many people noticed this Drivers Challenge. Did you add a sticker to your log book? It was great to see Thom Kowatch back out running his Wraith. 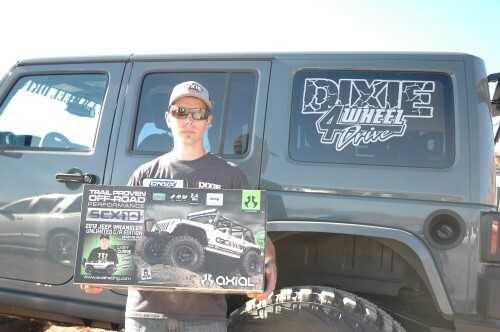 He was an original winner of the G6 before it was the G6 at the final Axial West Coast Championship. He is still sporting his prized limited edition Oliver’s Knives from that years event. 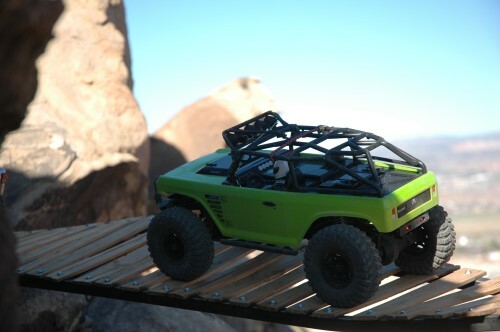 JC Jr was out running his green Axial SCX10 Dingo while wearing a matching top. His brother also was sporting matching jacket and truck. Is this the new fashion? How far would you travel for a RECON G6? We all know about the mad Austrian, Daniel Siegl, the most well traveled G6er who attends multiple G6es each year all over the world. But these two families have followed his traveling lead. 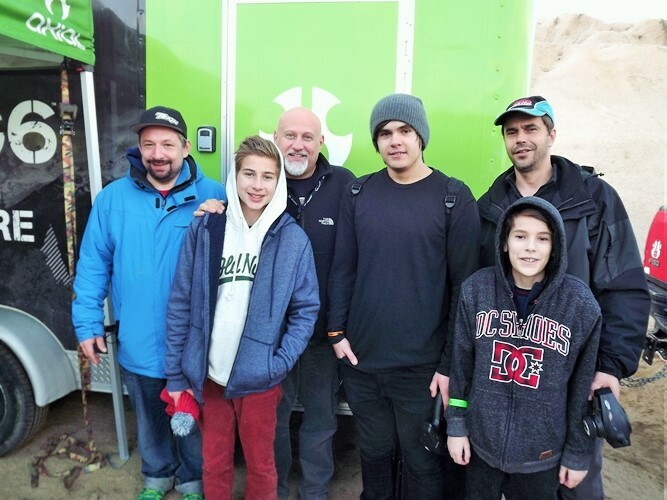 Stephane and Tomas traveled all the way from France via San Francisco and Muhamed, Elvis, and Adis moved to Reno from Bosnia just to get their G6 on! Well, probably for work with a RECON side trip, but I like my reason better. Team Drivers of the Day! RECON Rascal Drivers of the Day. 1.9 Driver of the Day. And since it was the Birthday Bash, many presents were distributed. 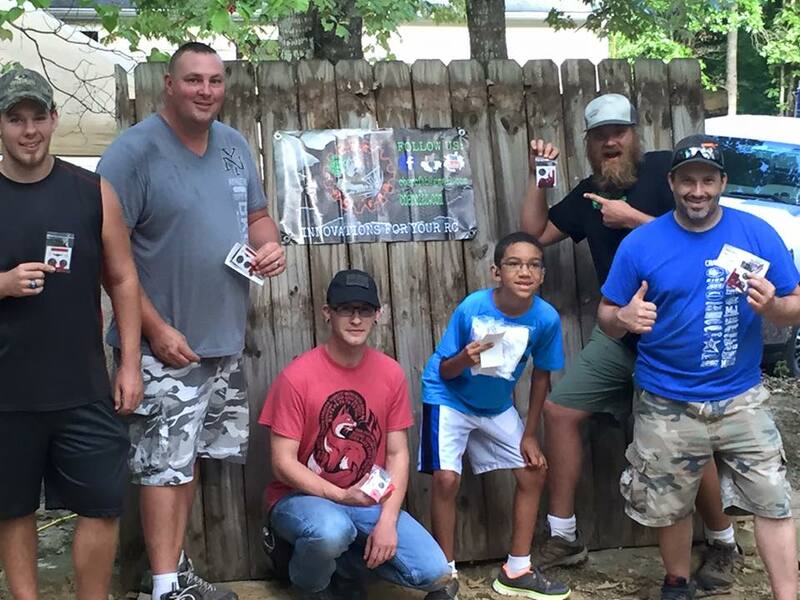 The following five members of the G6 Family took home some new SCX10s. Lucky Ducks! 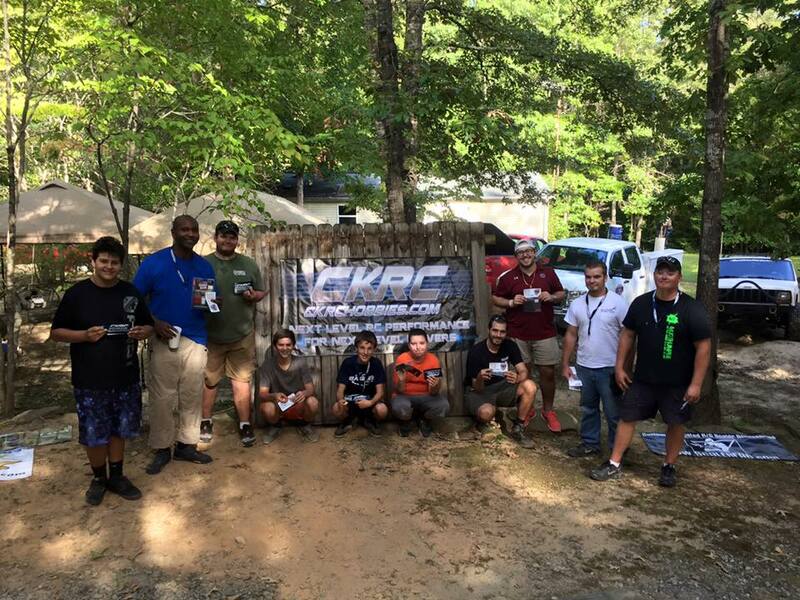 As always, the RECON G6 Birthday Bash and the 2015 RECON G6 season was a great time. 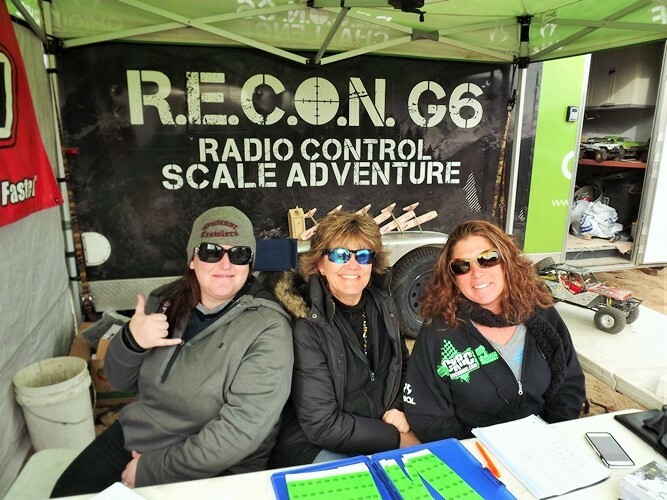 Again, thank you to everyone who participated in any RECON G6 event over the years! It’s a peaceful morning, about 7 a.m. and I’m not in any real rush. I am heading to a favorite place of mine; I normally crawl there solo. There hasn’t been much of scene where I’m headed for the past few years, so this is exciting. The peaceful morning is broken by the clack of the diesel, still dirty from last weeks RECON G6 at Logandale. Full tank of diesel and ready to hit the open road. 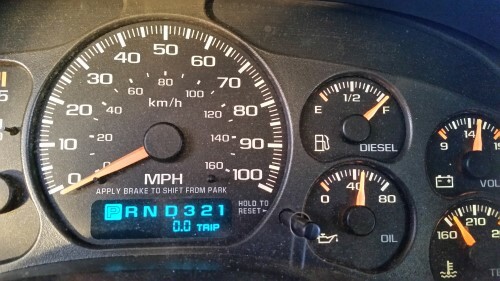 Trip meter at zero, I am driving approximately 110 miles to my destination. 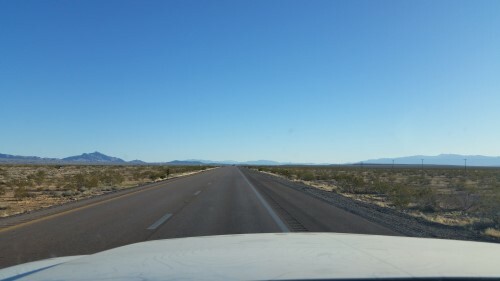 I’m on Interstate 15 heading north; if you read my blogs you may know this road already. In just under an hour I see the familiar sign to Logandale/Overton where events you may have read about have been held. 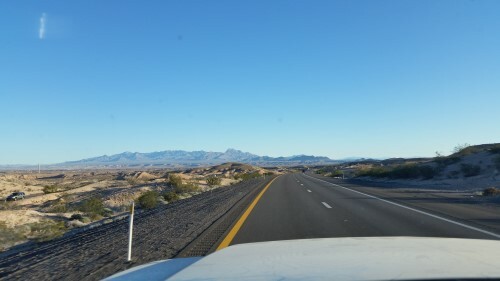 Past the Logandale exit and into Arizona. 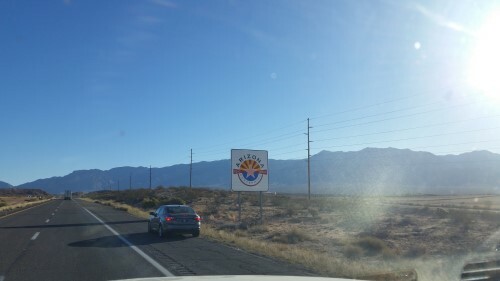 Yes Arizona, but this is not my destination. 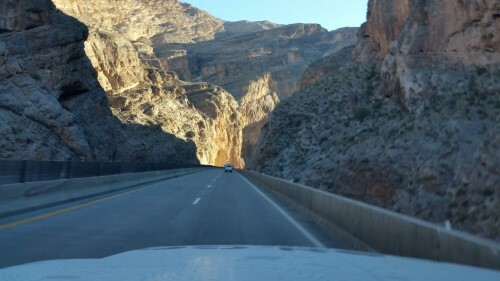 Through the Gorge and into Utah. 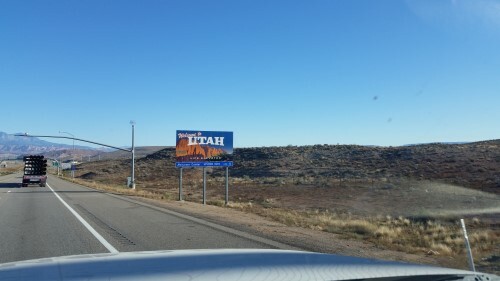 St George, Utah to be exact is where I am headed. 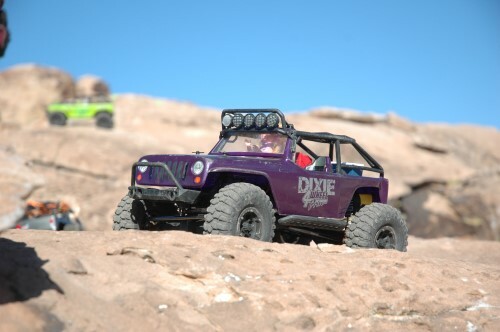 We are meeting up at a local 1:1 off road shop, Dixie 4 Wheel Drive. If you follow me on Instagram, chances are you have seen me share some of their RC posts. 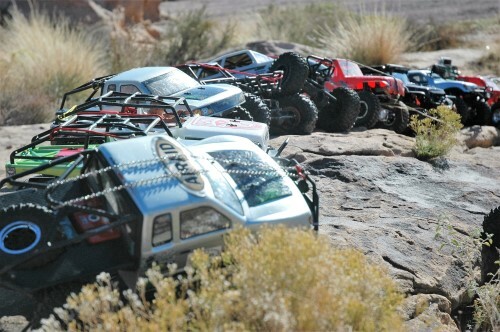 These guys are an authorized Axial dealer, so this was a perfect meeting spot for Reaction Crawlers. 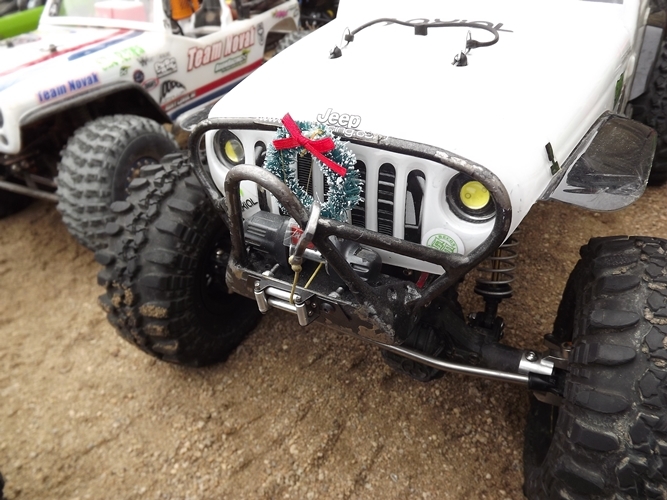 No shortage of built jeeps here. 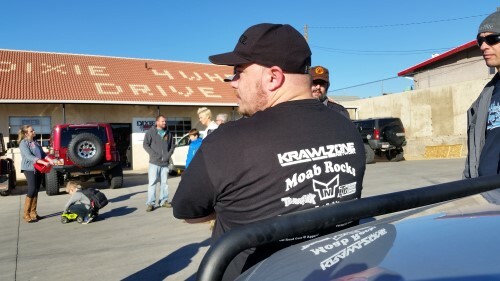 KrawlZone RC from Layton Utah, about 30 minutes north of Salt Lake, was present and ready to take on whatever was in store. 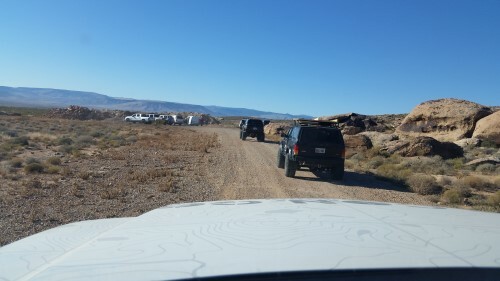 Small convoy out to the location and I am sure the terrain will not disappoint. 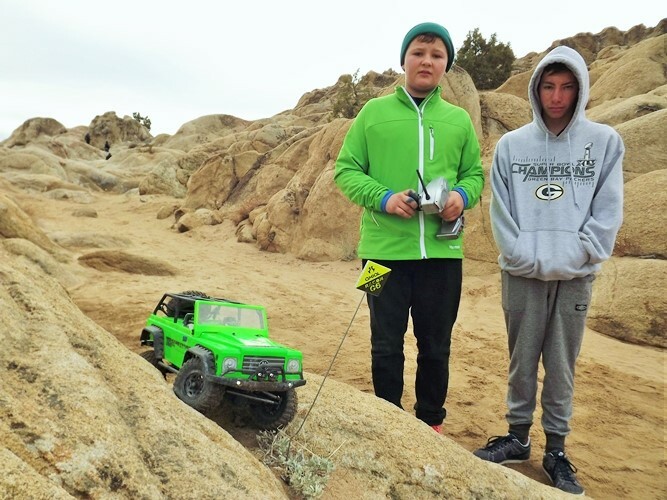 From a place that has not really had a scale RC scene in the past few years to this first group, I am excited. 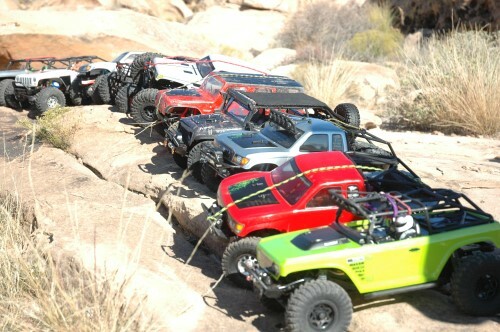 Jeeps, Honchos, Deadbolts, Spawns, and Wraiths. Looks like we will see it all on the terrain today. 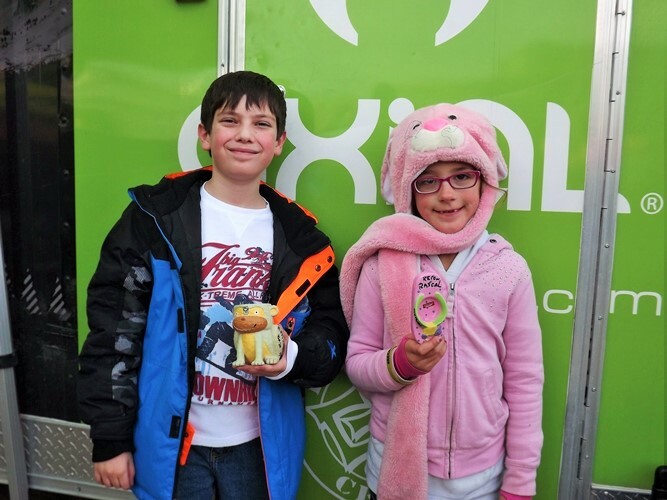 Some of the kids already flying their favorite shops stickers on their rig before they even have a license! I was really digging the paint job on the Jeep G6 pictured below. 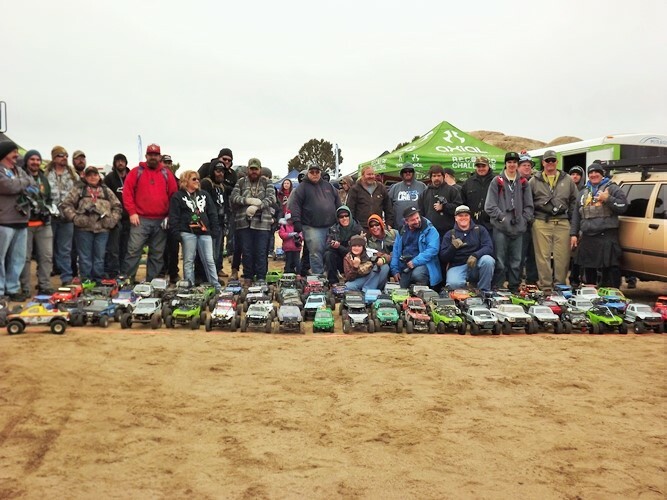 Group picture of this bunch of off road enthusiasts and they are eager to get on the rocks. 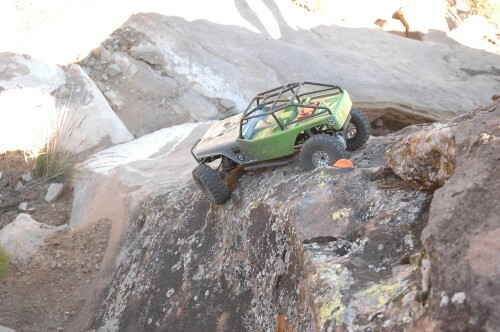 This Axial Honcho on the rocks was a little bit of throw back with the little green Axial markers on the rocks. I have always been a fan of the Trail Honcho. Drivers had a course marked with green Axial markers or had the option of taking on a more challenging bonus line marked with orange Axial markers. 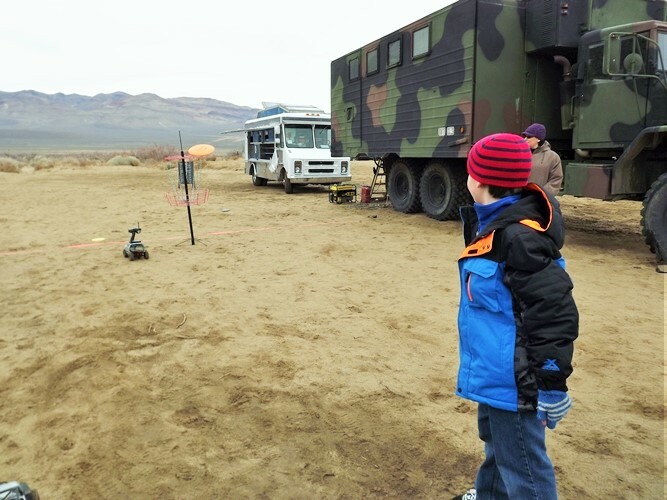 Kids were able to follow the course and see what their rigs were capable of while also sharpening their driving skills. There are a lot of box stock trucks out here and these guys are driving lines. 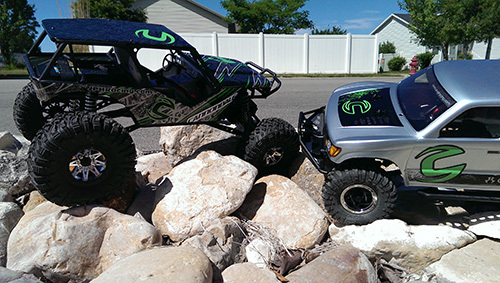 There are a few guys who have some nicely modded rigs, so there is something for everyone. 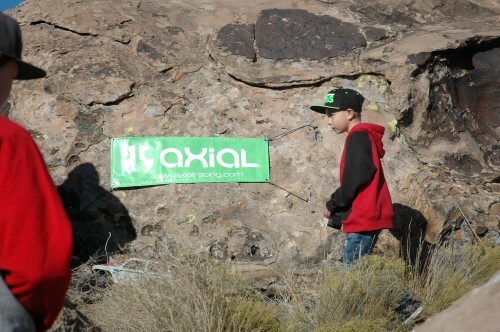 I spot this Axial banner and then see the Axial green marker. 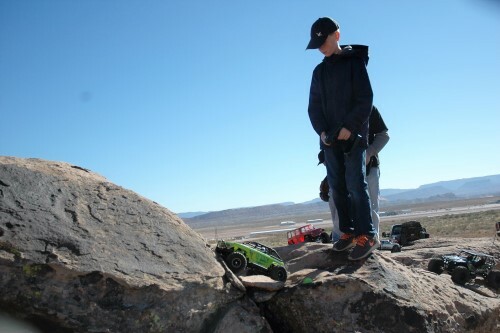 This is a steep climb, but this kid and his honcho are up to the challenge. Everyone gathers around this obstacle to watch the trucks make this climb. Some are getting a daisy chain going. This started the taunting between the Jeepers and Toyota fans. 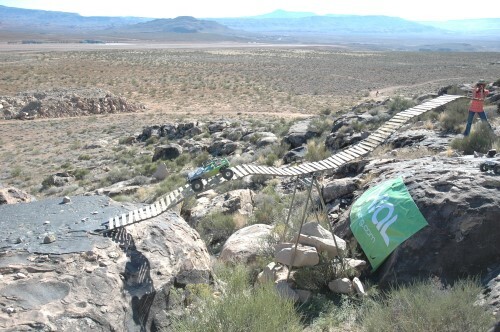 This was an impressive obstacle, but this course has so much more to offer. 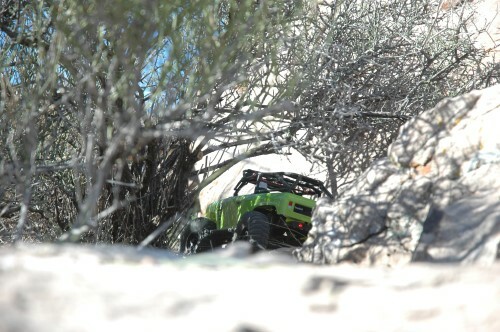 This cool little scale trail through the bushes was cool, but these drivers had no idea what lies ahead. 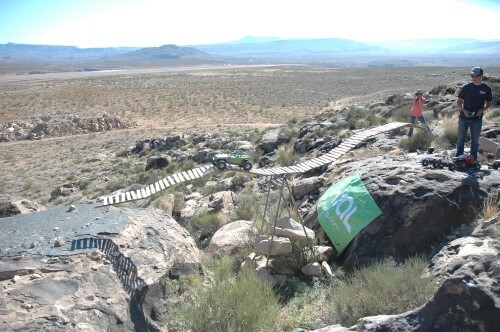 Some vertical climbs and technical drops were crowd pleasers, but not the highlight sections. There is a lot of scenery to take in and some really cool lines to follow. 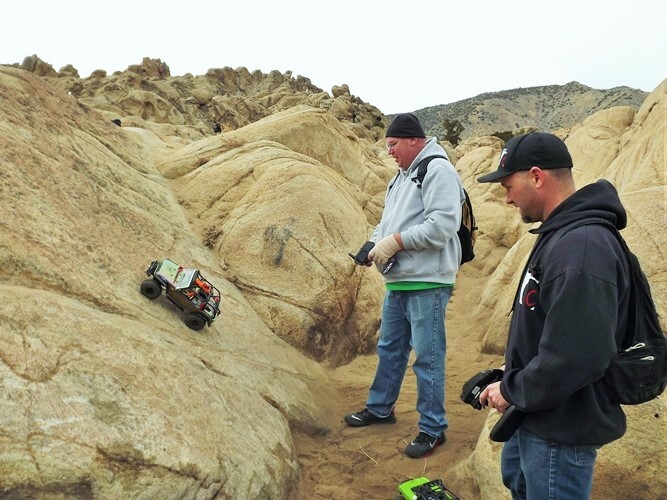 There is plenty of help on trail; 1:1 drivers who also RC, like AJ pictured above. I can see all the team work going on as well. So we have all seen bridges right? What makes this one cool? Is it the way you leave out on vertical rock on a ledge? This bridge really got the adrenaline going. There was a drop if you fell off. 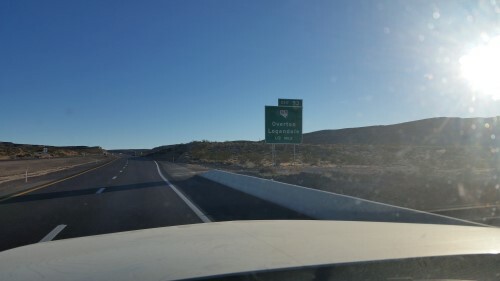 I was a little nervous taking pics of everyone driving across it. 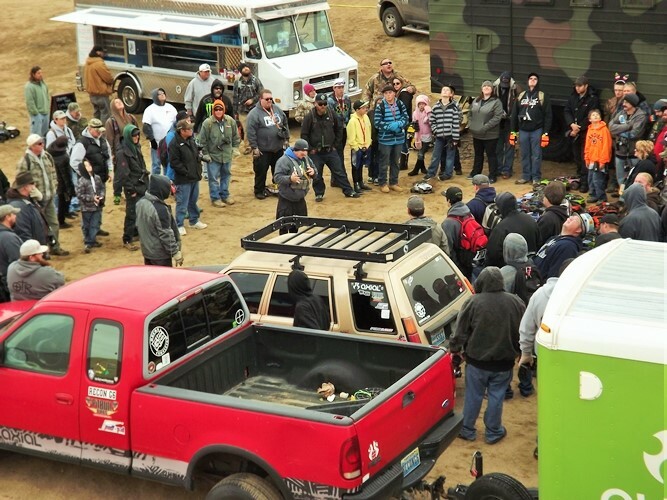 The Jeeps and Honchos showed no fear, as they continued to taunt each other. 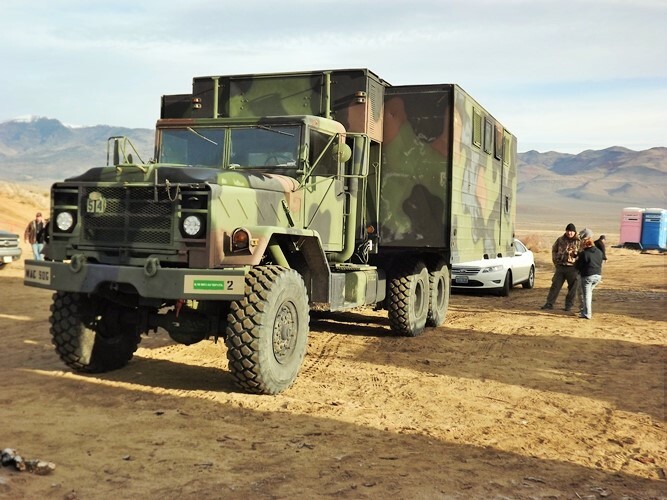 One thing is for sure, these guys have some nice looking rigs. In case the bridge doesn’t excite you, there’s another obstacle towards the end. How about this giant teeter totter? It’s a little intimidating with the break over point being so far over the center. Fun to watch! 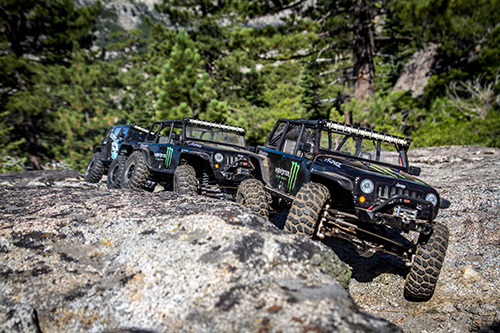 As for the Jeep or Honcho debate, both sides pushed the limits of their rigs. Drivers did just as well on the bonus lines. 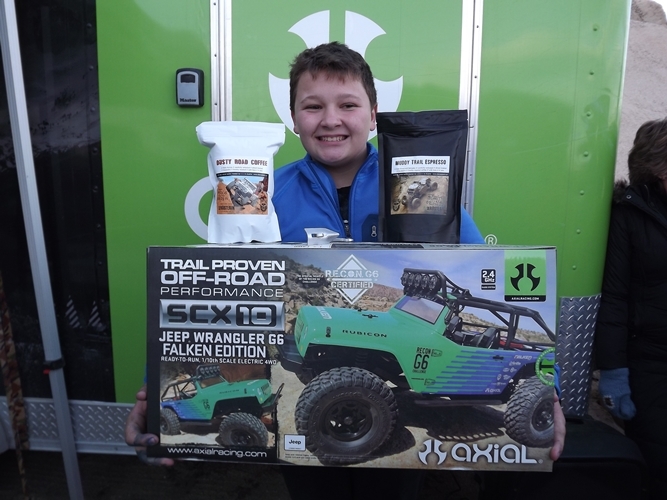 Reaction Crawlers did a raffle and one lucky person went home with this Axial Jeep JK Casey Currie Edition and a battery! This was a great time. 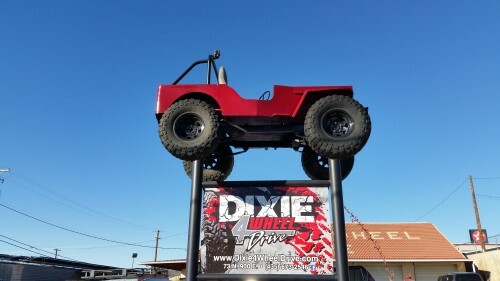 If you’re ever going through St George, Utah, stop in and check out Dixie 4 Wheel Drive. I am sure some of the Reaction Crawlers will be around. 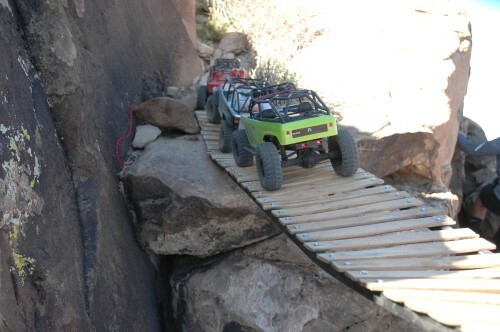 You can never go wrong with scale trail Defender action, especially when sand ladders and trailers are used. What really sells the video, the attention to details in the bodies and diesel engine sounds that play with your mind. 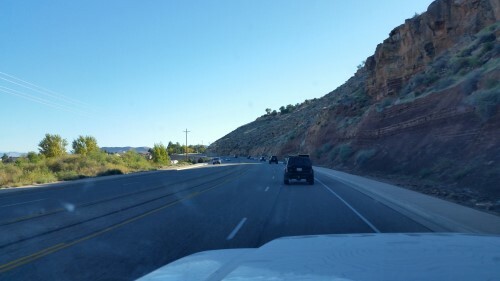 One can’t help but assume that these are full size Ranger Rover Defender 90’s wheeling out in the high desert. 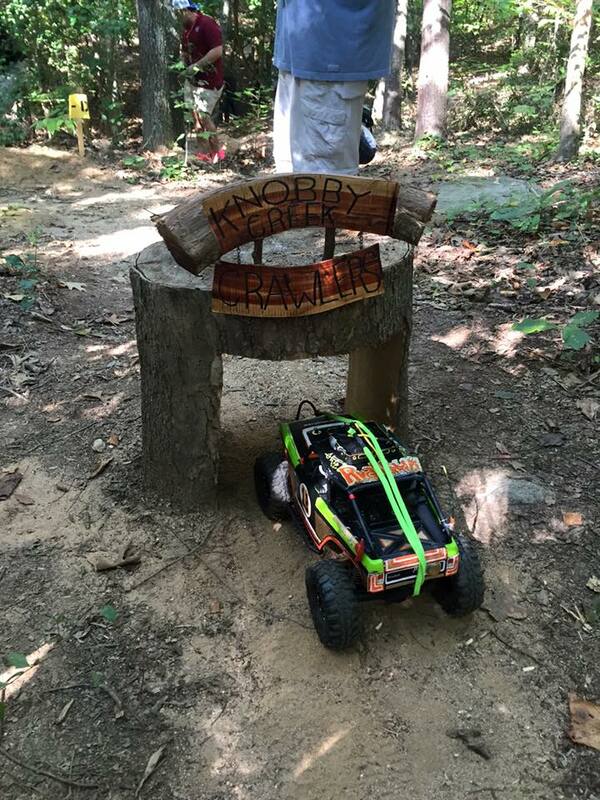 Even the scale trail marker signs confirm your suspicion that there is no possible chance these could be R/C vehicles. 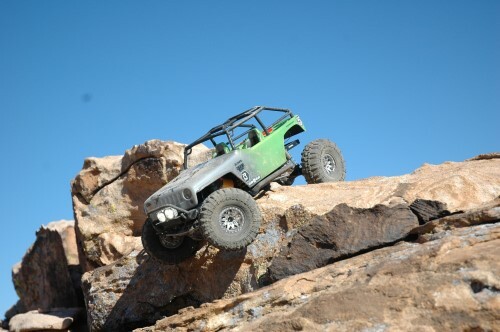 For more scale trail video action, make sure to check out the Rivas Concepts YouTube channel.